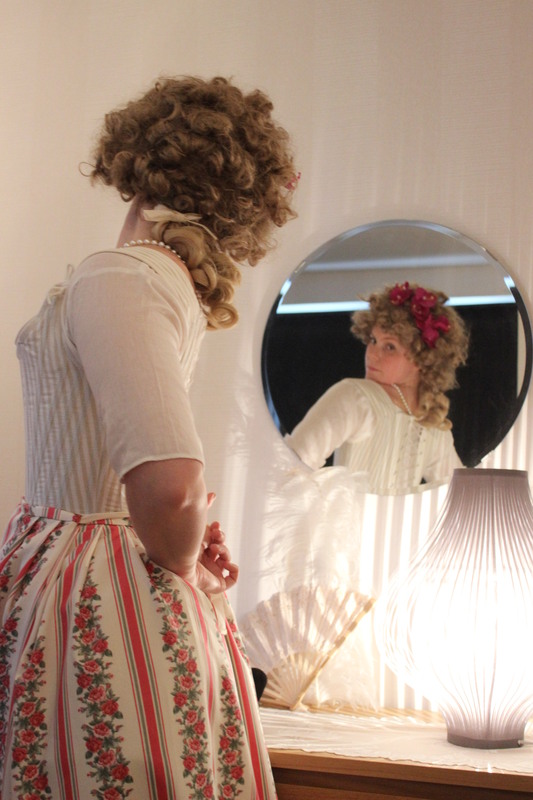 Jen at Festive Attyre made the most fabulous recreation of it a while back. 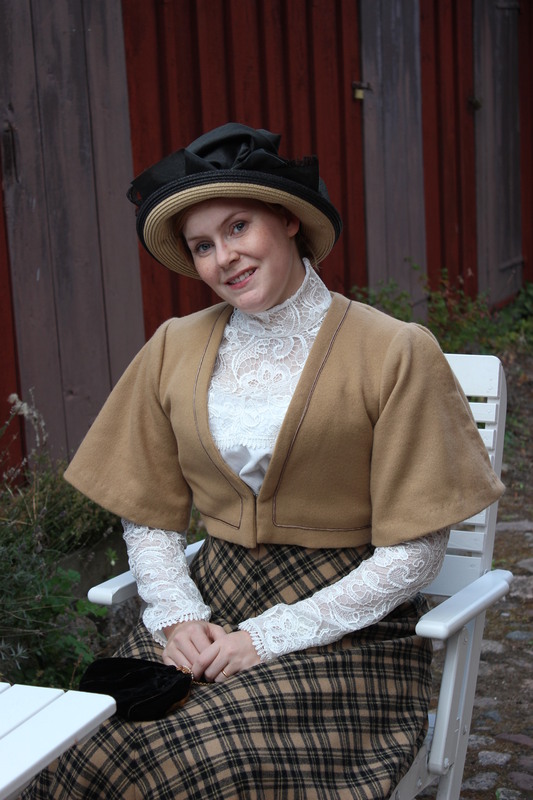 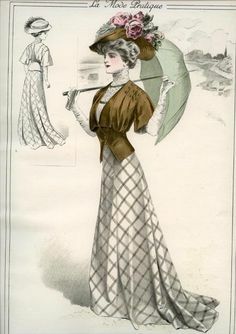 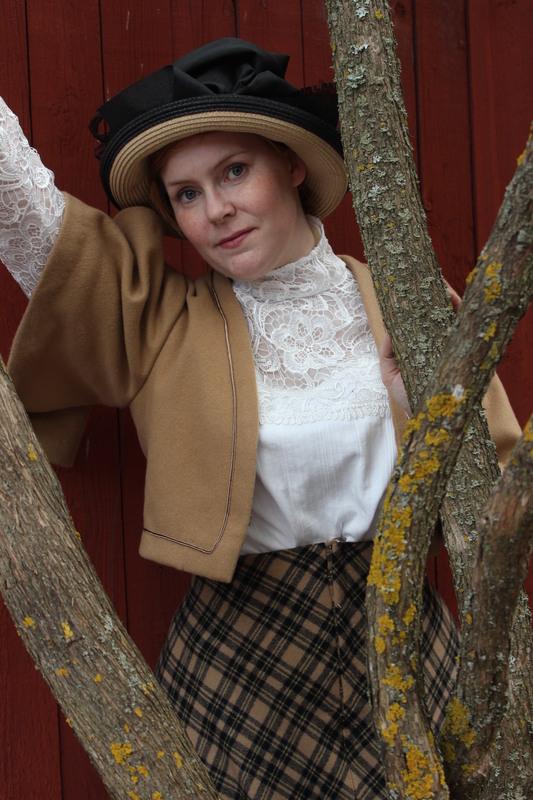 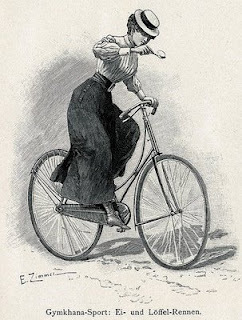 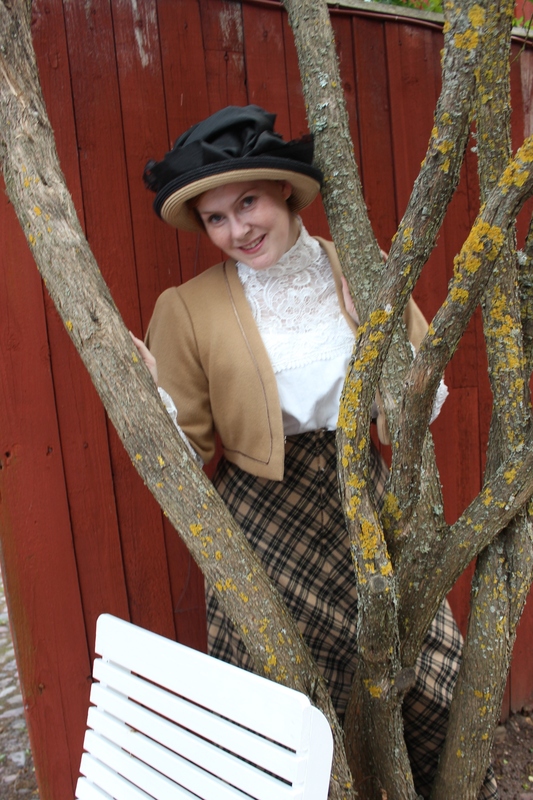 And even though I knew I could never match her skill or perfect Edwardian look, I really wanted a similar look. 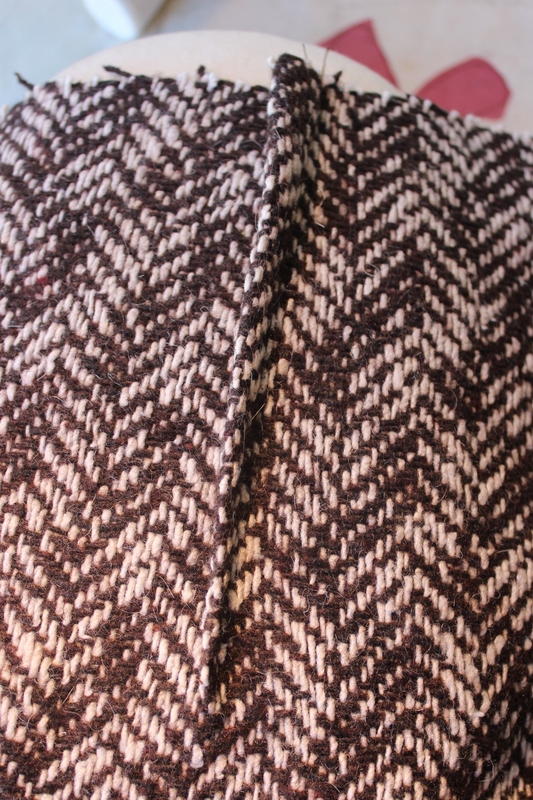 So when the HSM challenge 9 – “Brown” approached I scouted out my stash for the perfect brown and plaid wool fabric, and got to work. 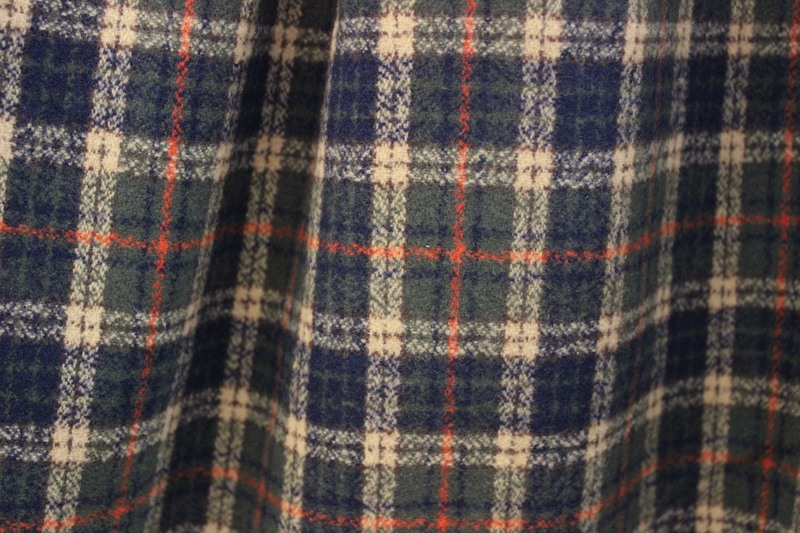 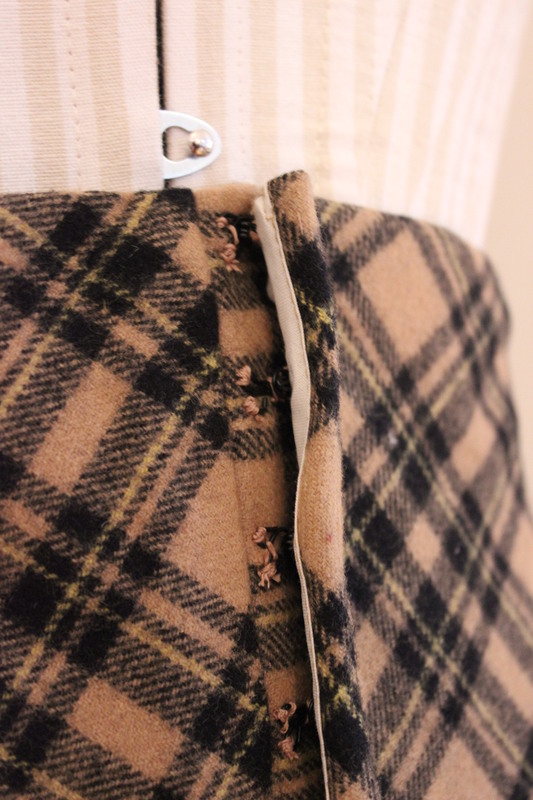 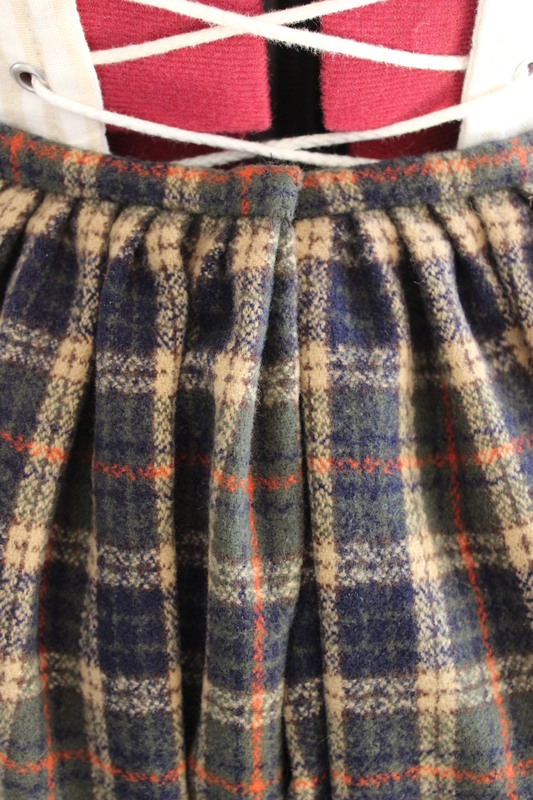 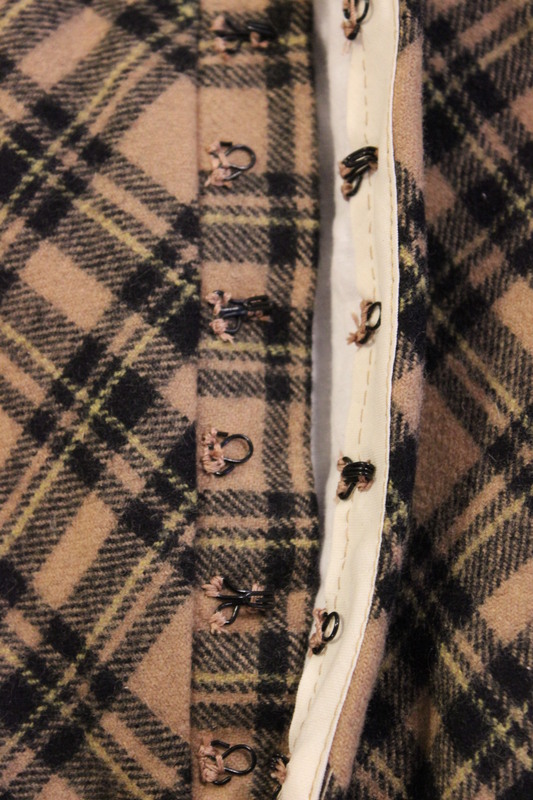 I cut the pieces on the bias, carefully matched the plaid to meet at an angel at the seams. 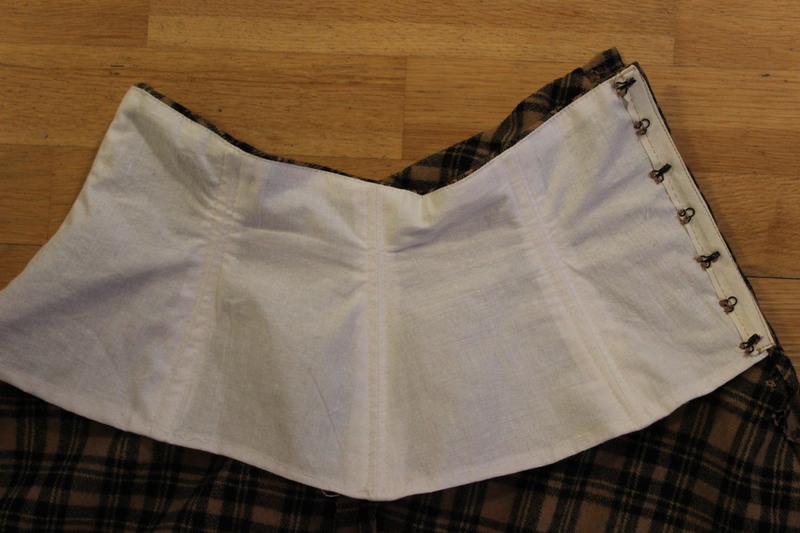 I used some white cotton for the foundation and stitched bias-tape to make boning channels to get that nice body-hugging look of the corseted skirt of this era. 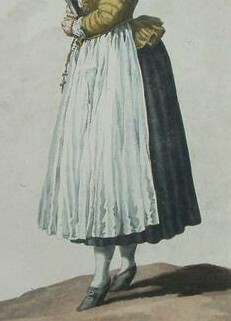 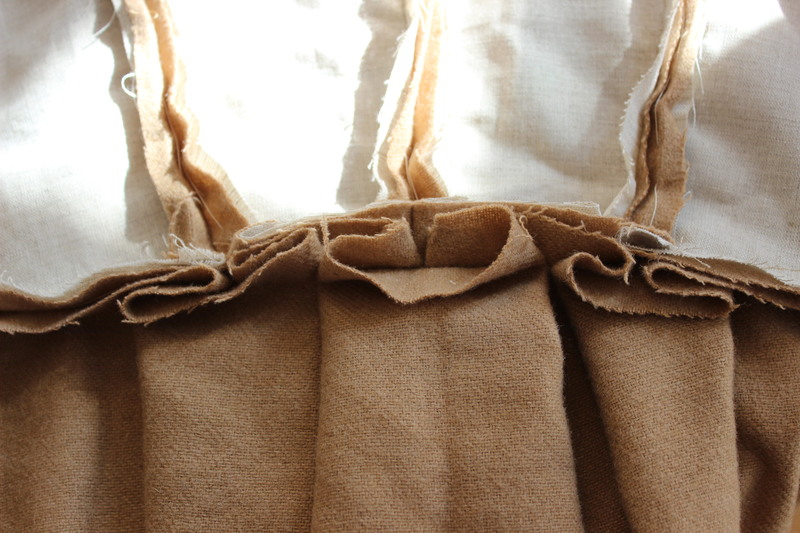 The skirt closes at the front with hooks and eyes, over a placket and secured with another pair of bones. 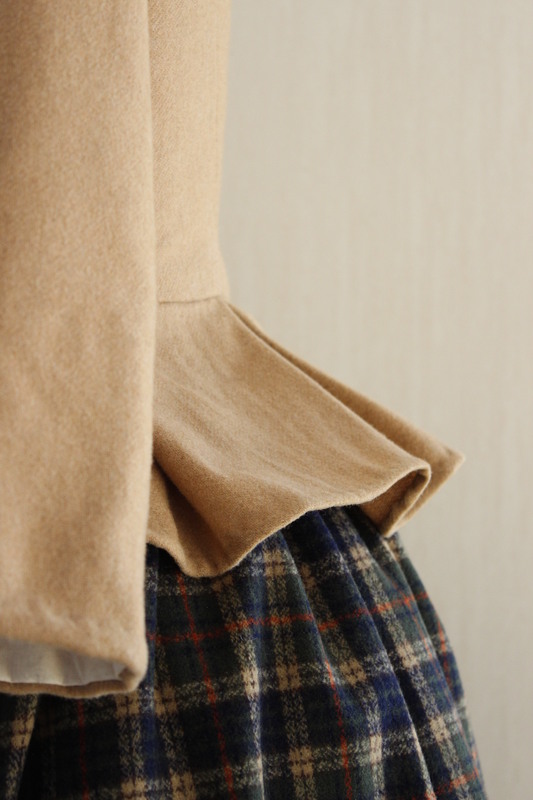 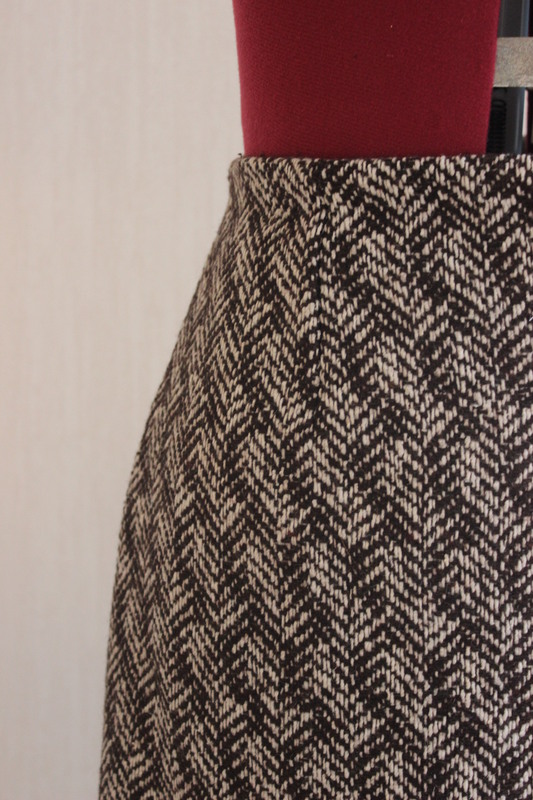 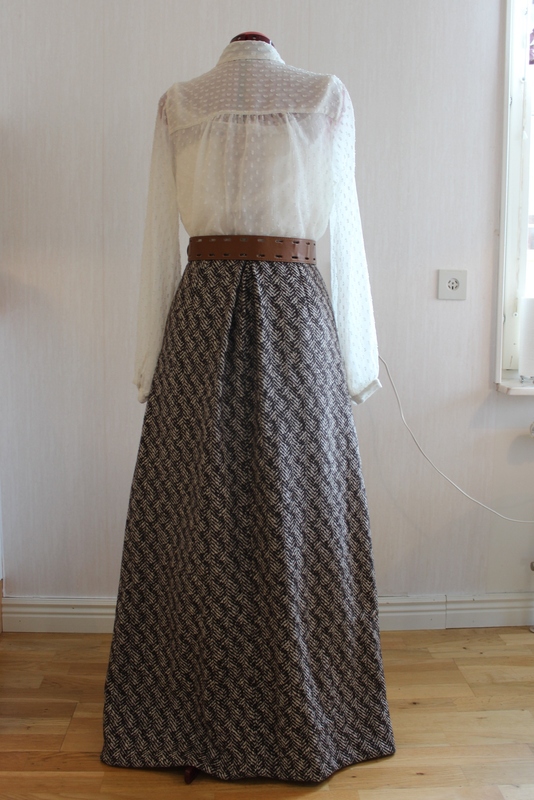 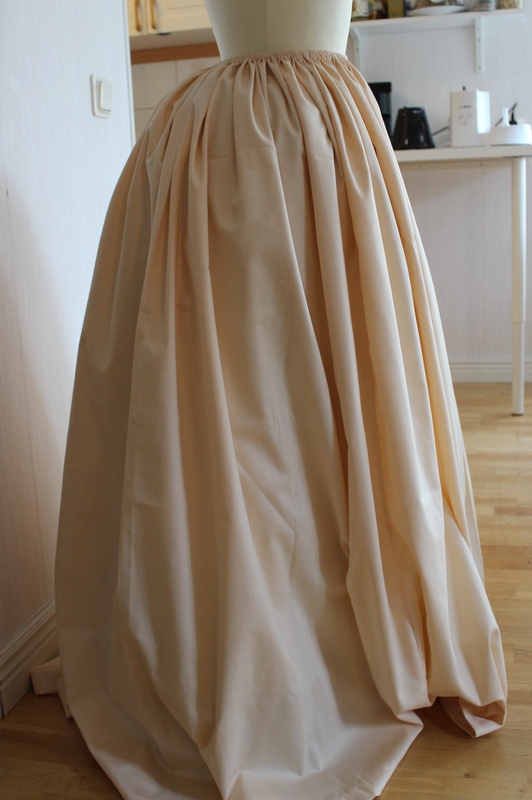 I finished by hemming the skirt using a 10 cm wide strip of beige cotton for hem-facing. 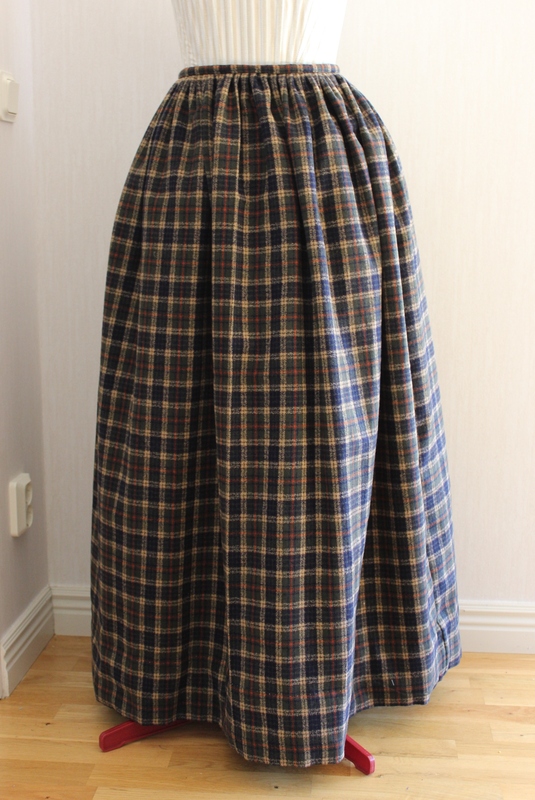 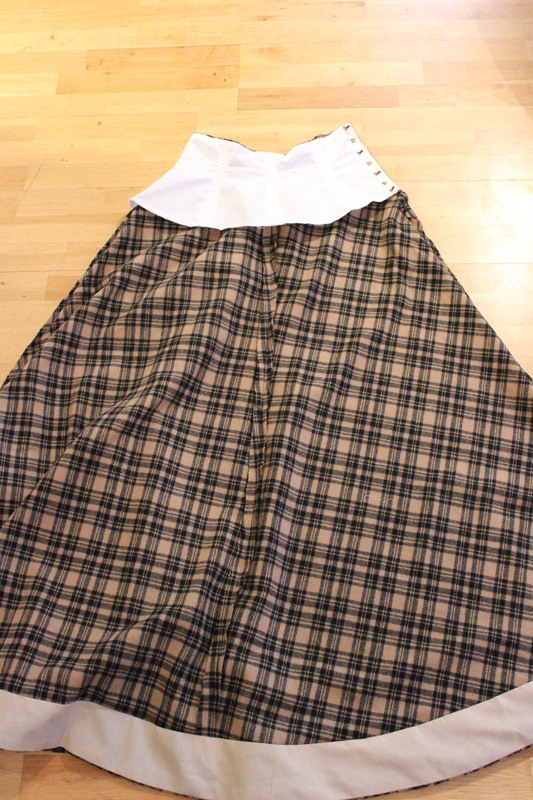 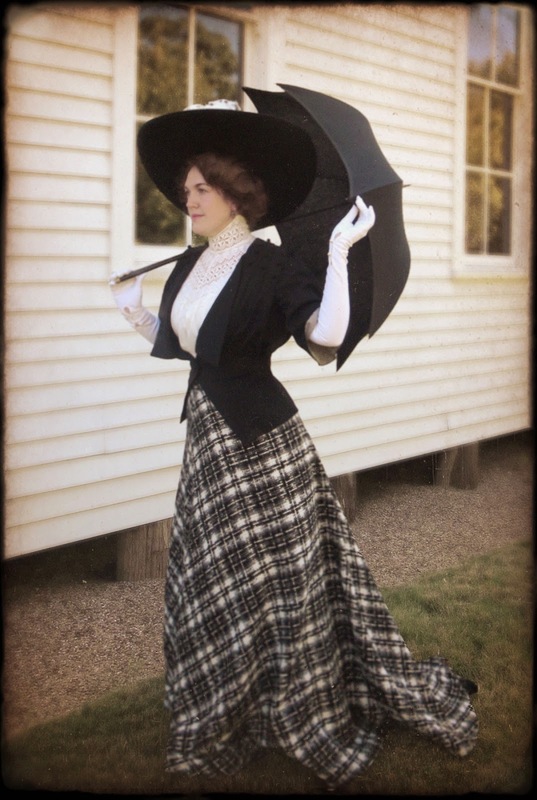 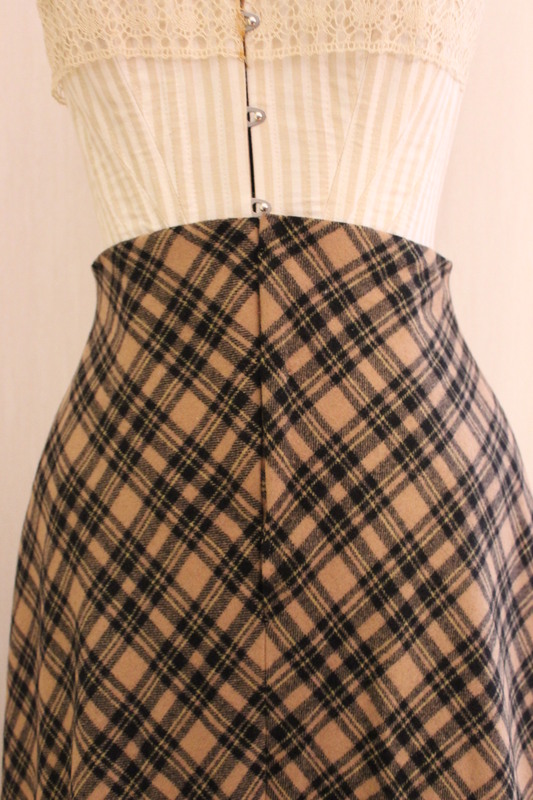 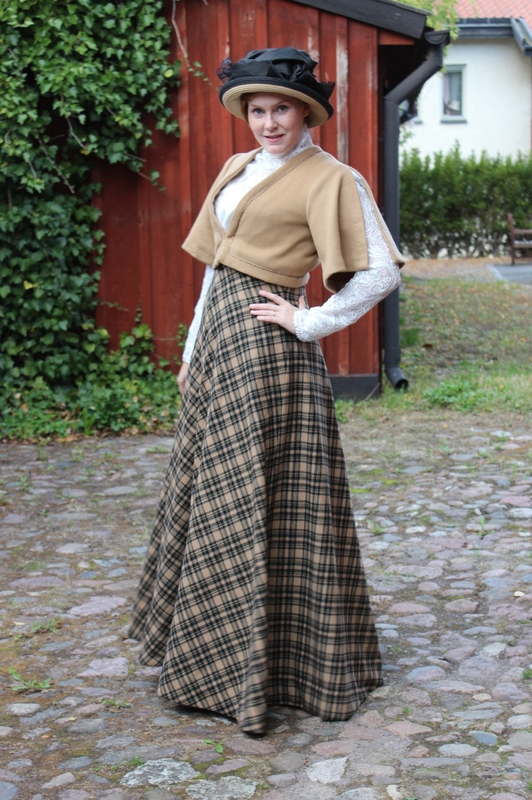 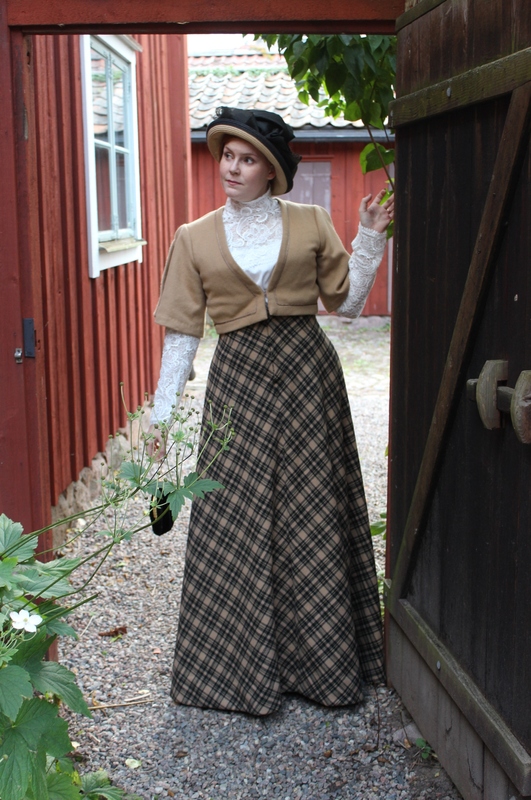 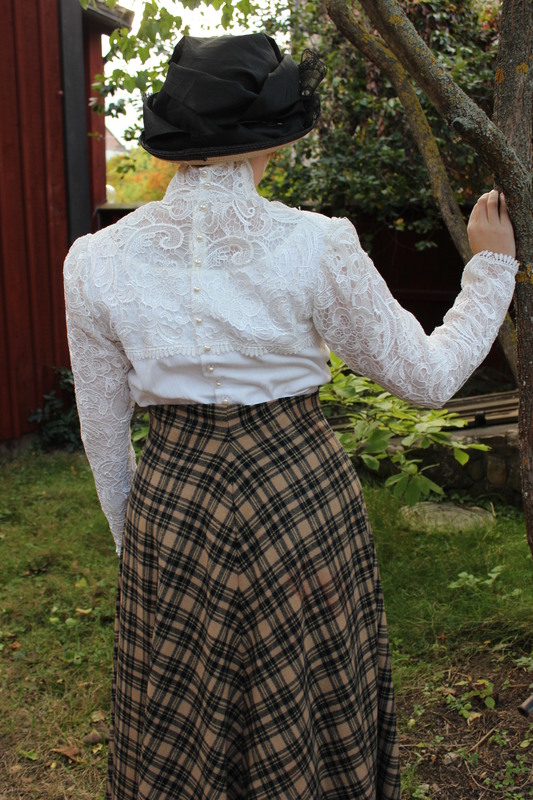 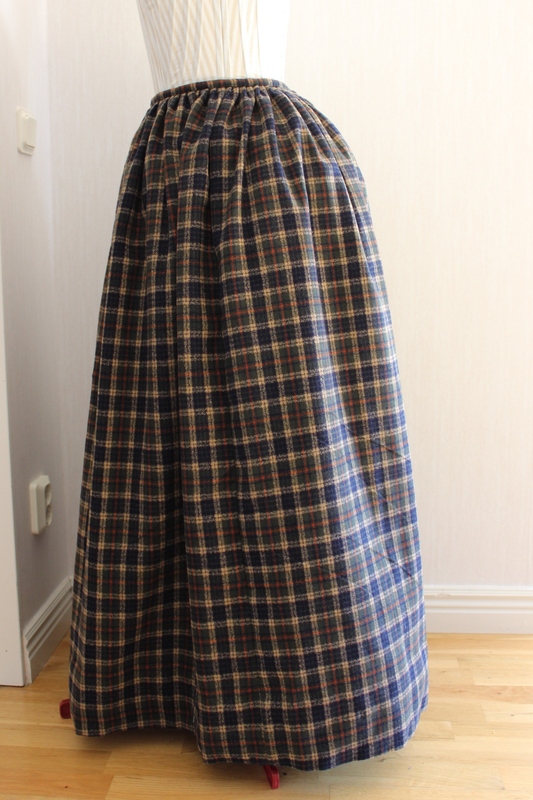 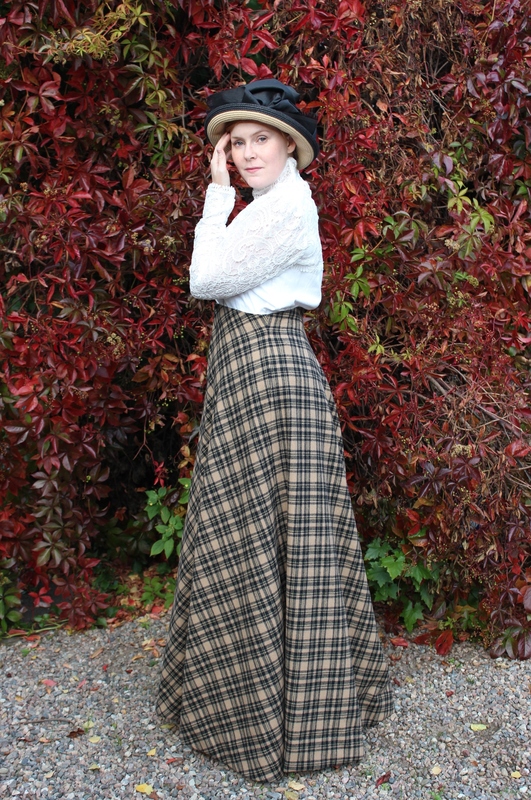 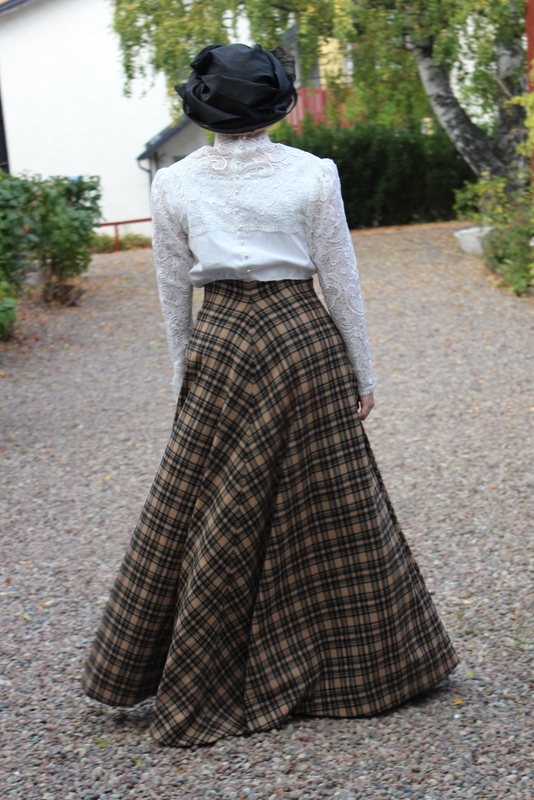 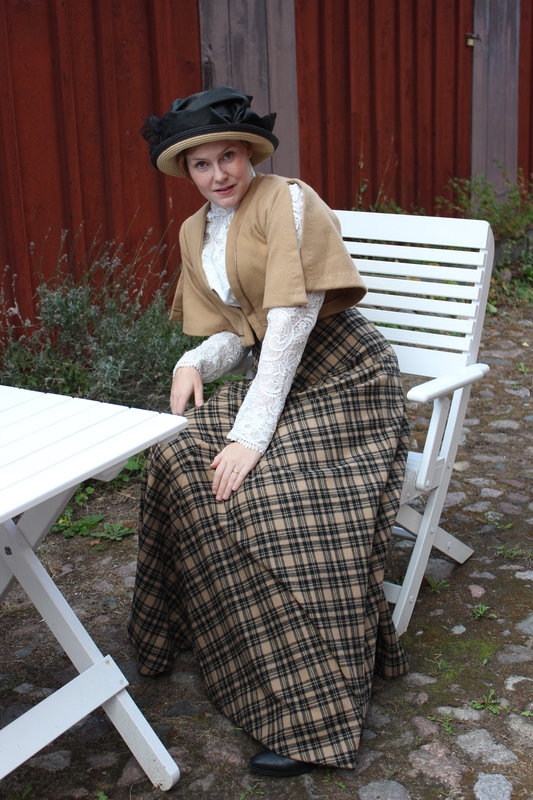 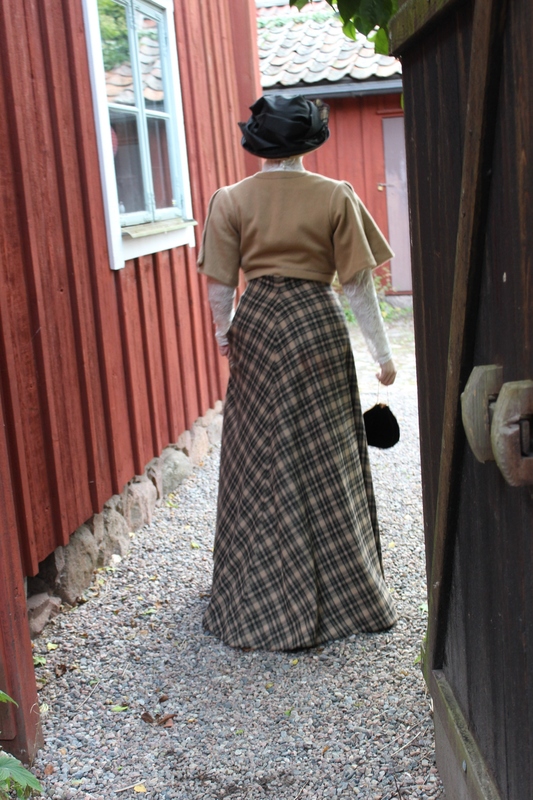 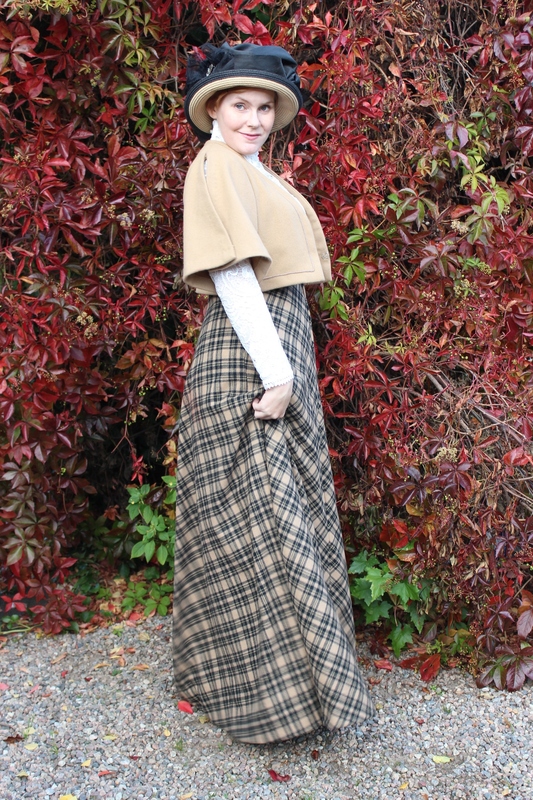 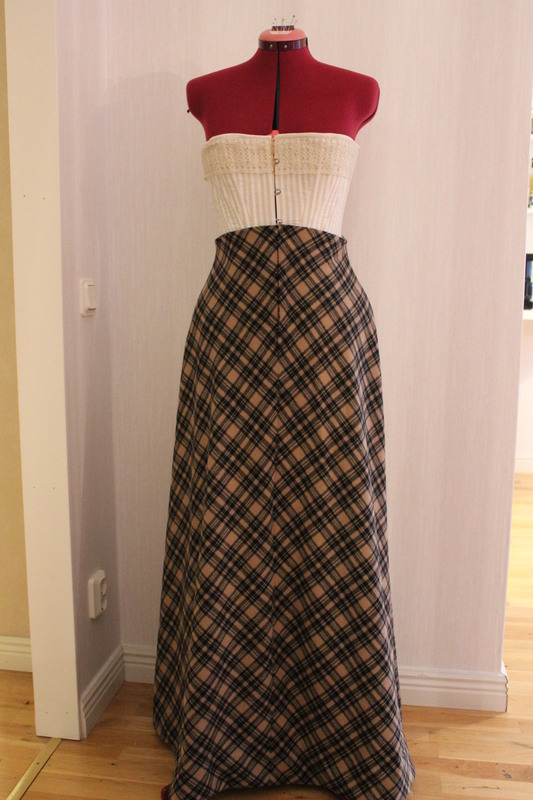 What: A 1900s brown/plaid walking skirt. 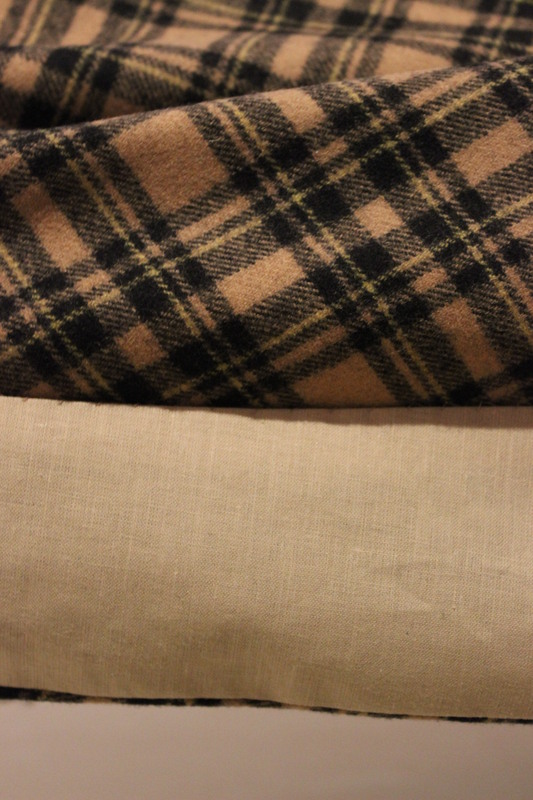 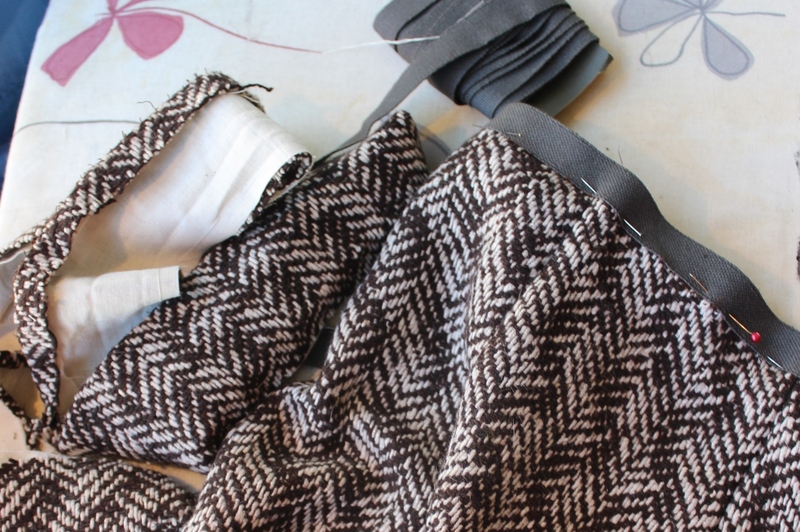 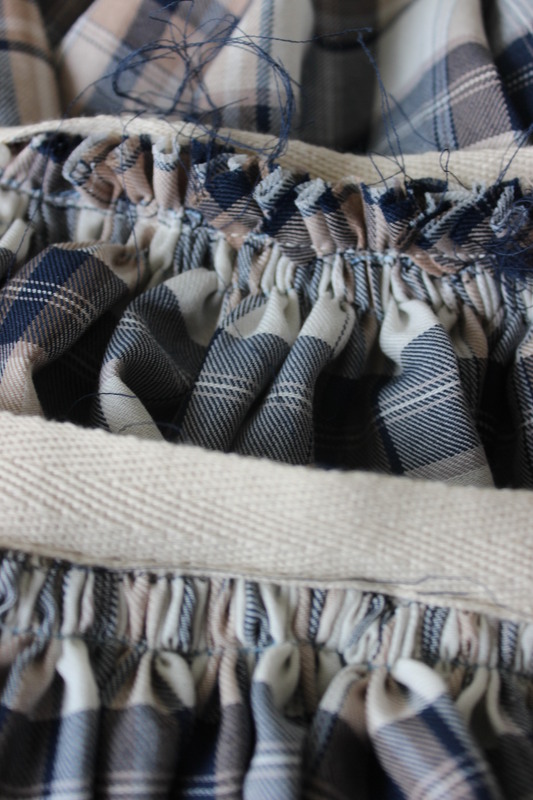 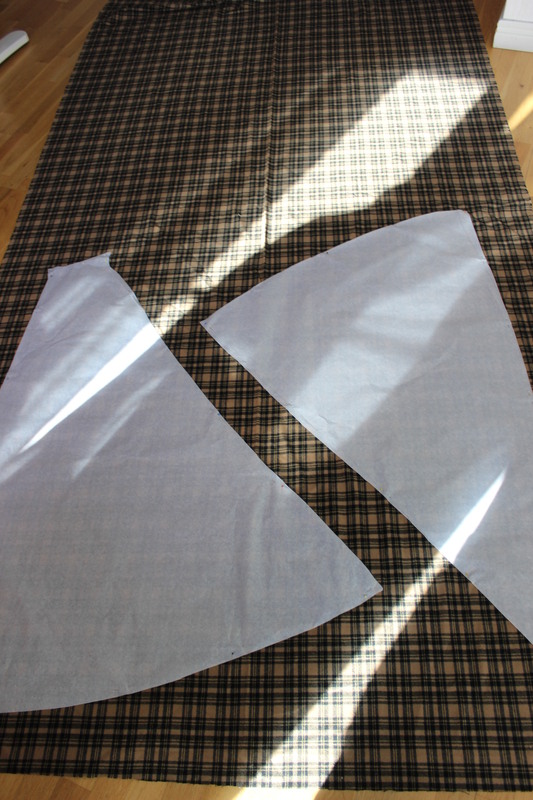 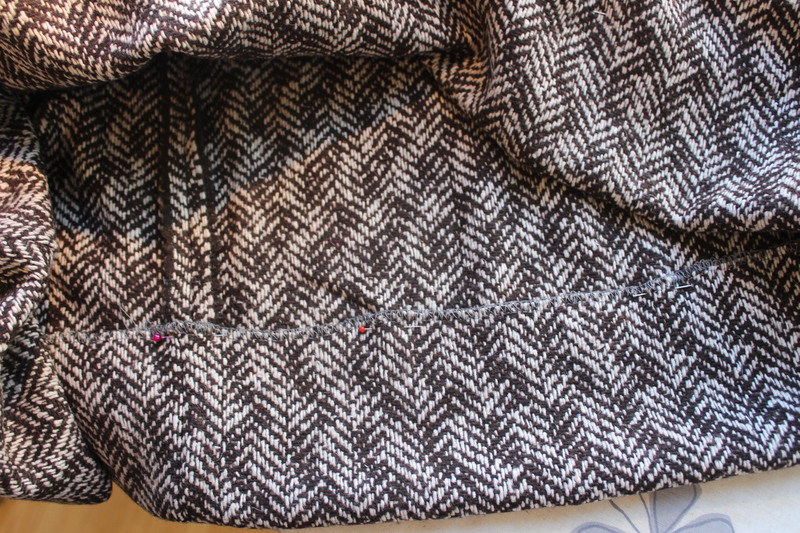 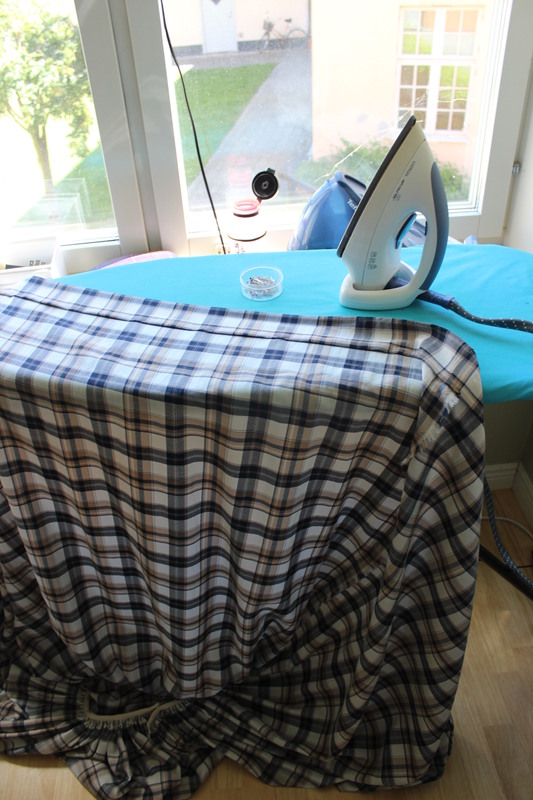 Fabric: 3 m of plaid wool an bits and scraps of cotton for interlining and hem-facing. 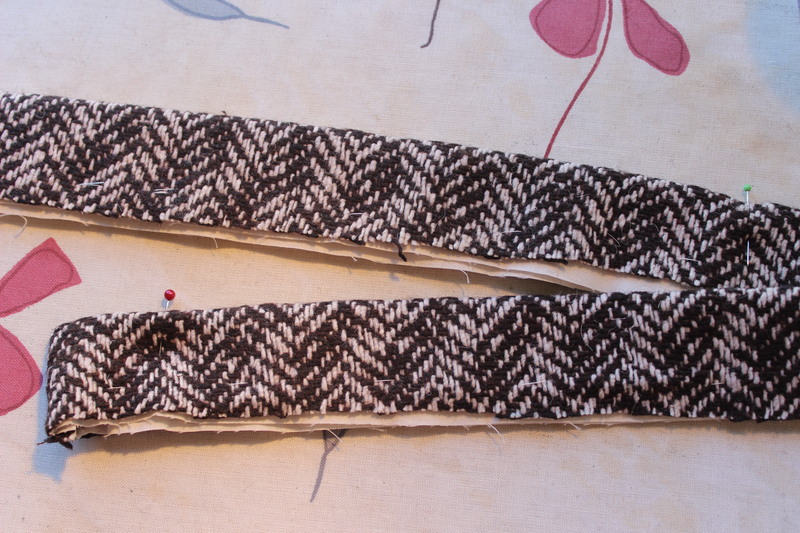 Notions: Thread, 2 m of bias-tape, 2m of boning, and hooks and eyes for clouser. 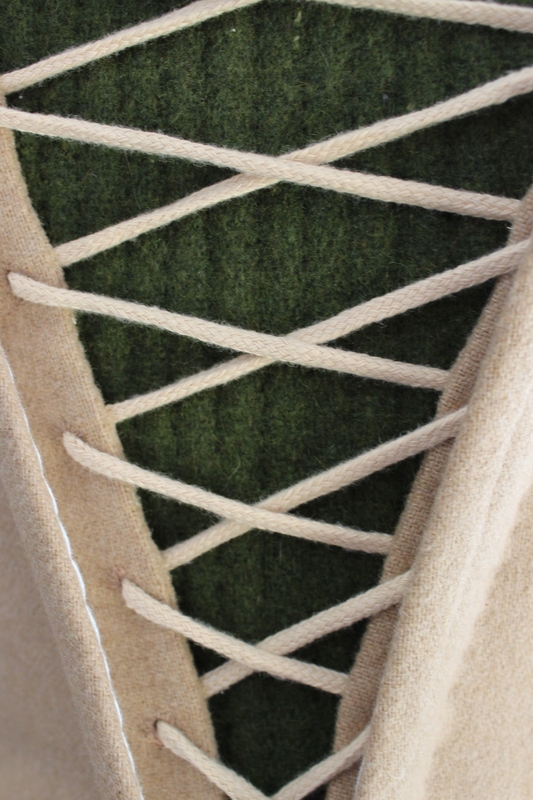 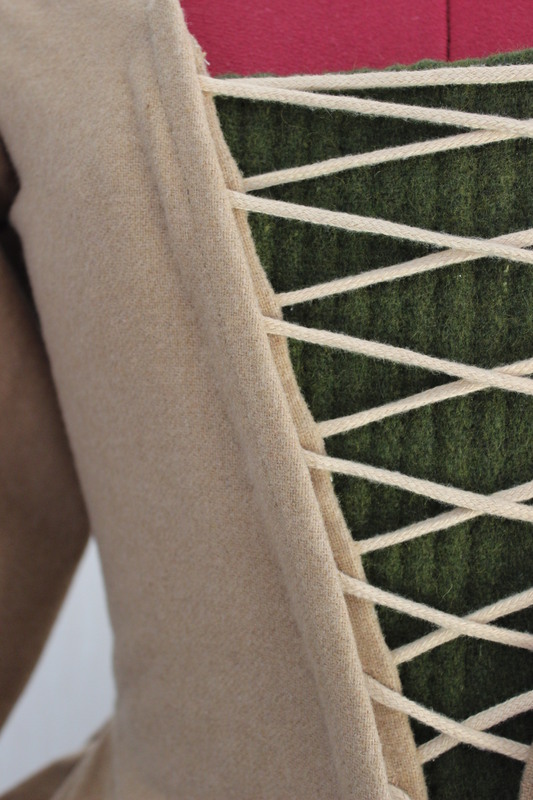 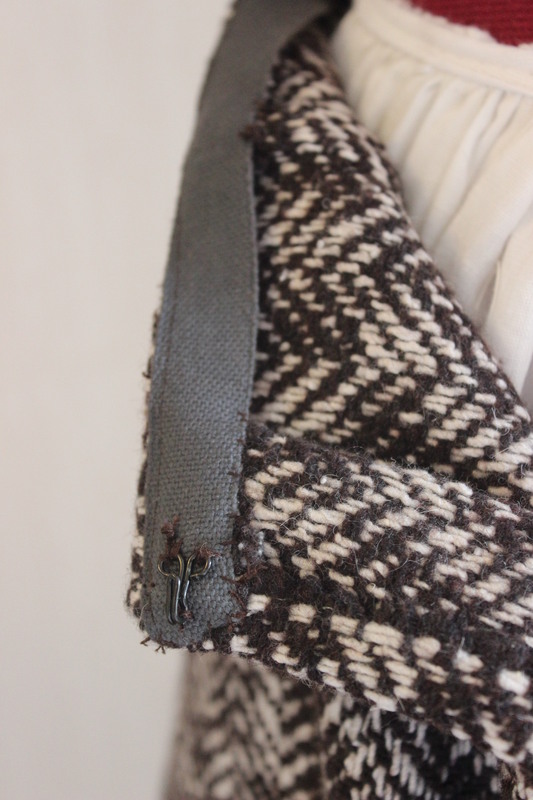 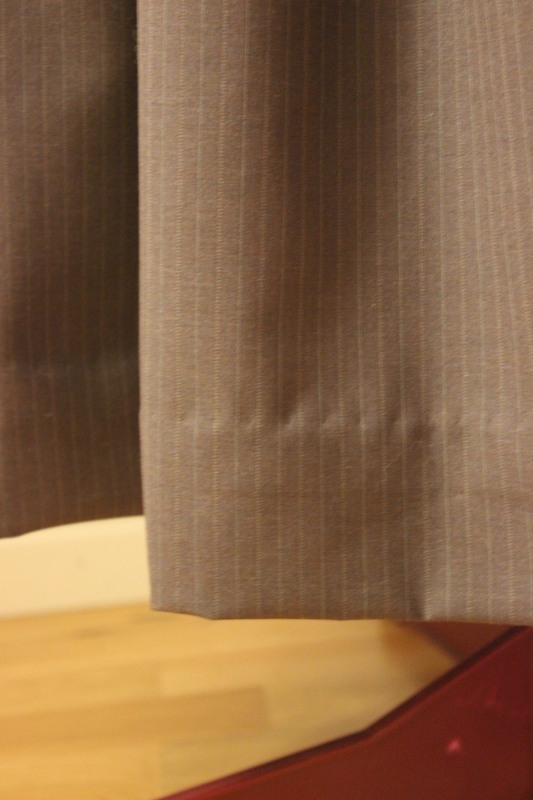 Time: About 10 hours – the fabric matching and hand stitched hem took more time then usual. 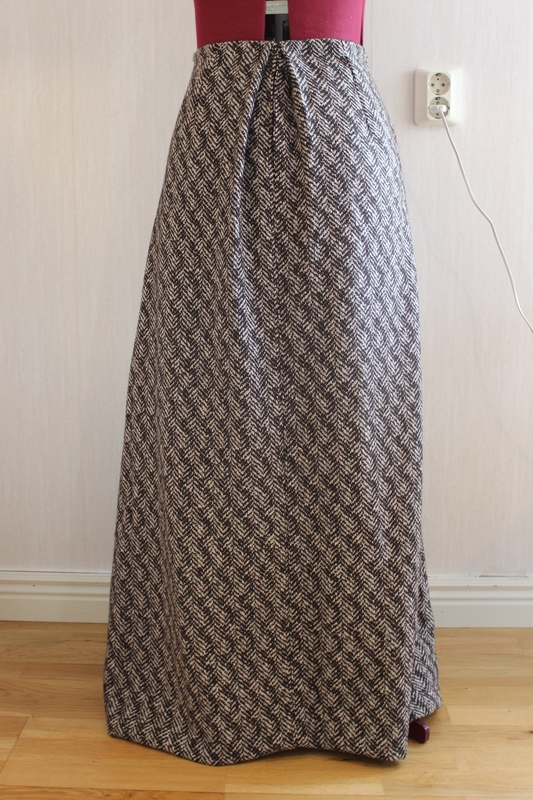 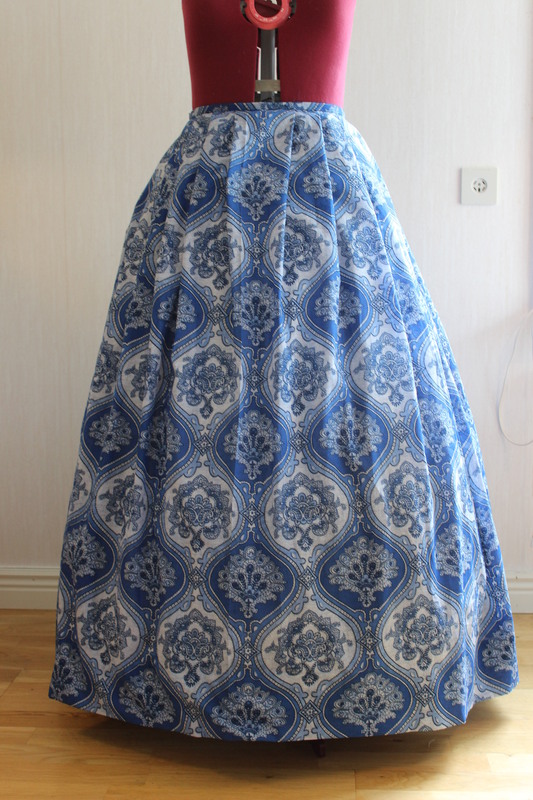 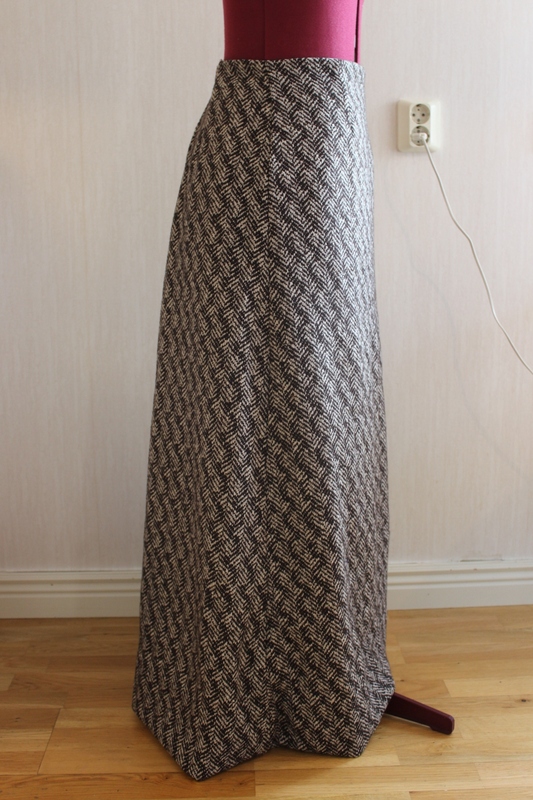 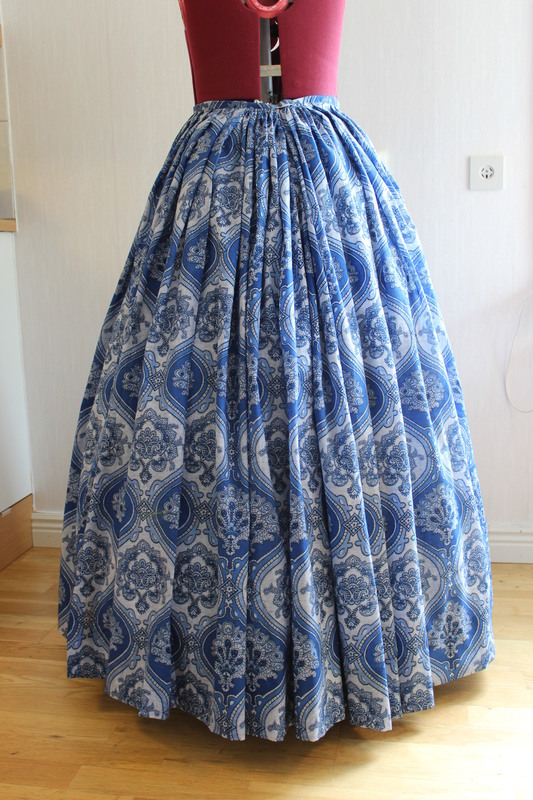 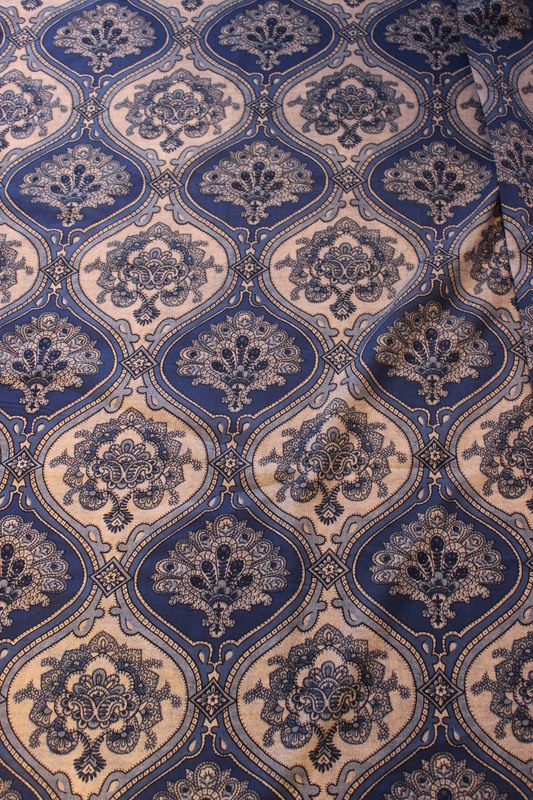 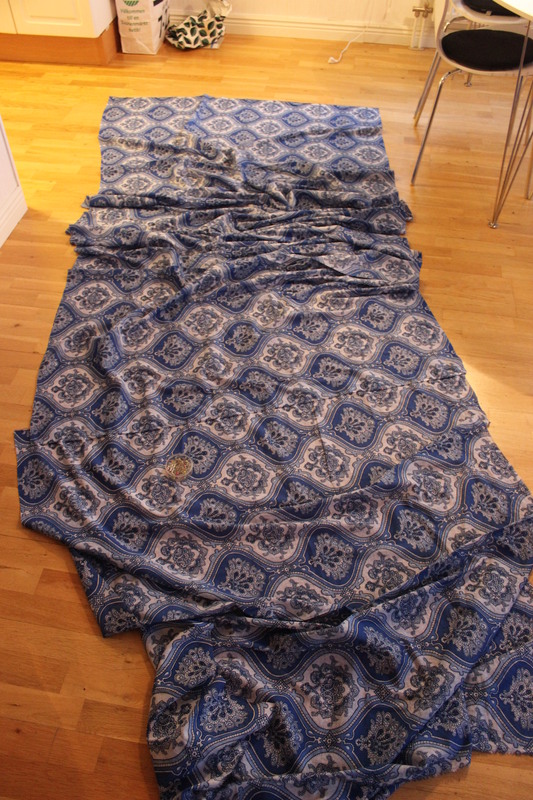 Cost: About 200 Sek (32Usd) – all material came from stash but I bought this fabric on sale about a year a ago with a similar project in mind. 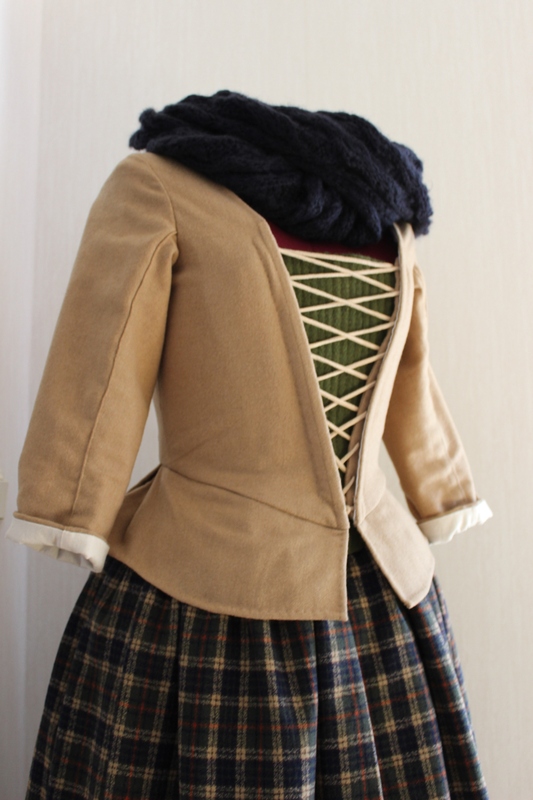 How historical accurate: Pretty good. 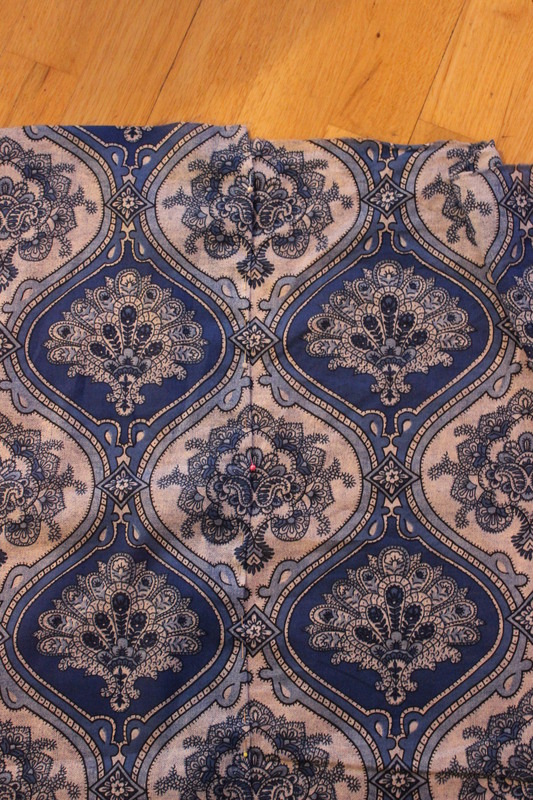 The fabric and pattern are all good. 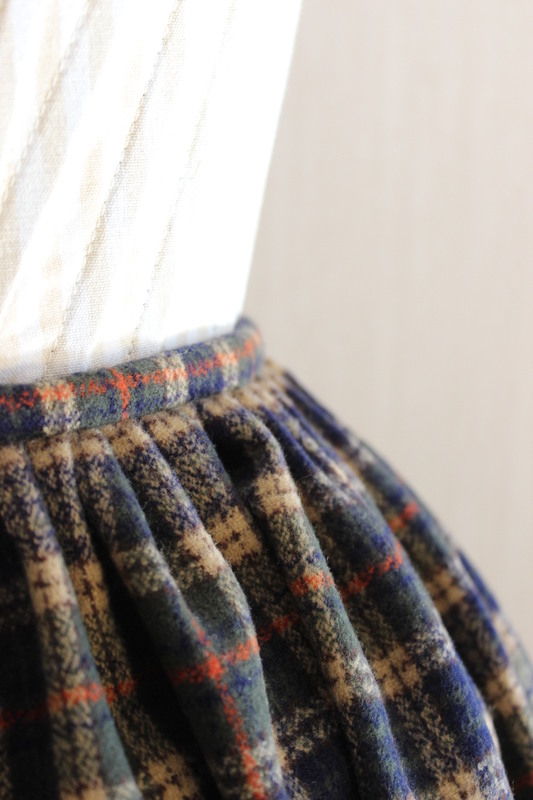 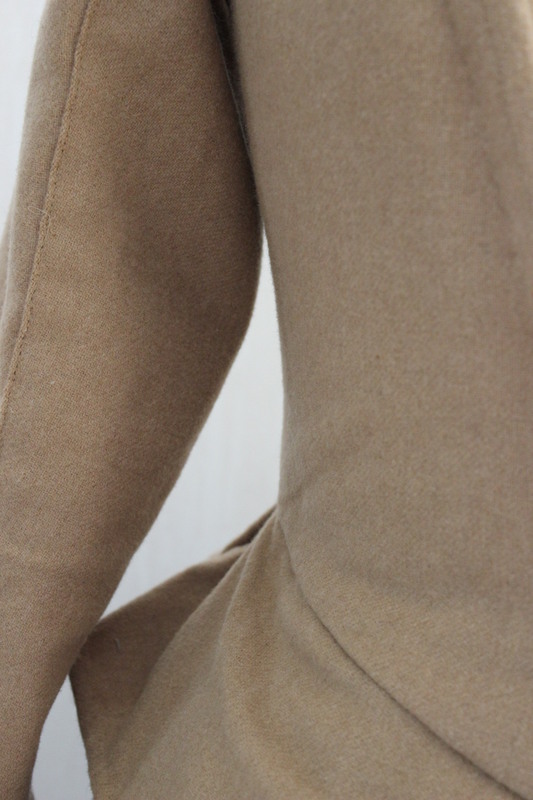 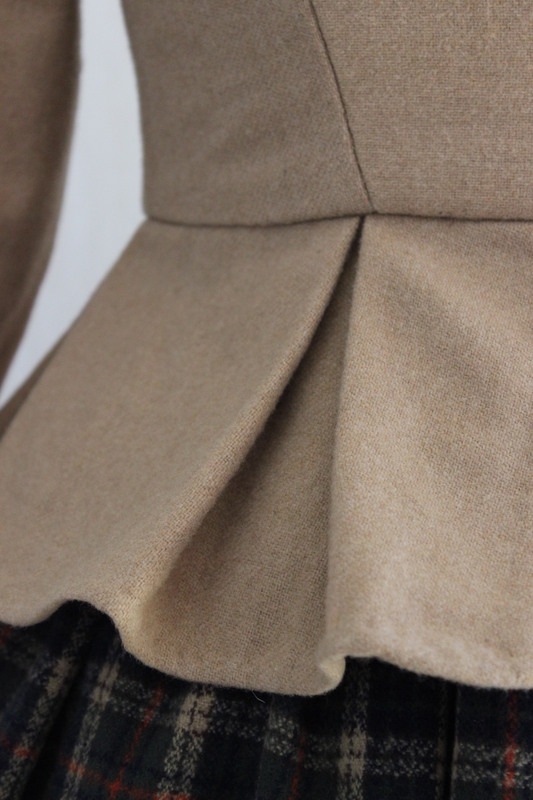 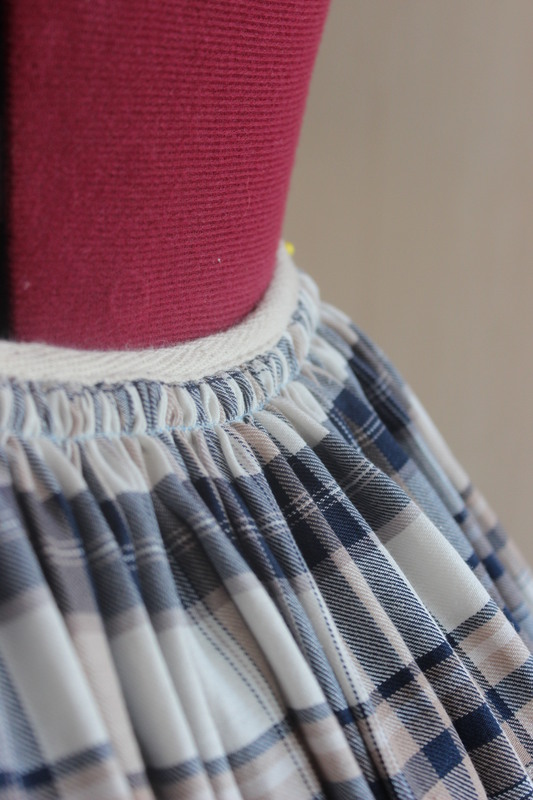 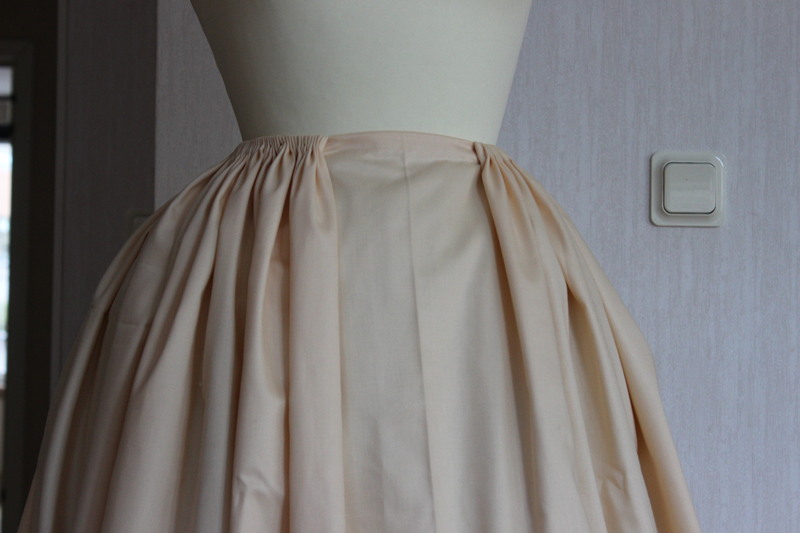 Even though most of the skirt is made by machine the finishing are hand-stitched, as it should be fr this period. 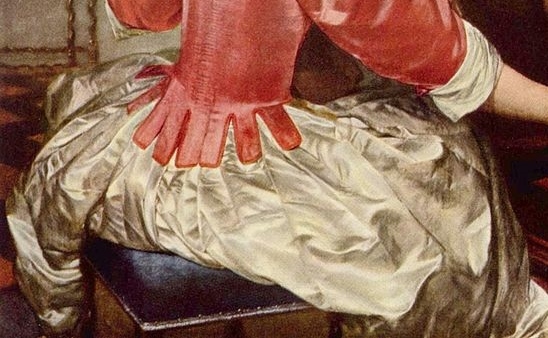 I did use some modern techniques on the foundation piece. 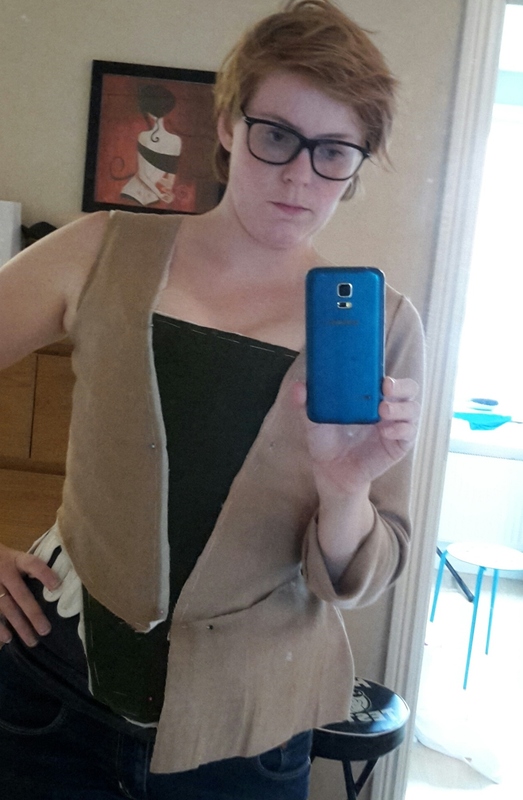 I’d give it a 7/10. 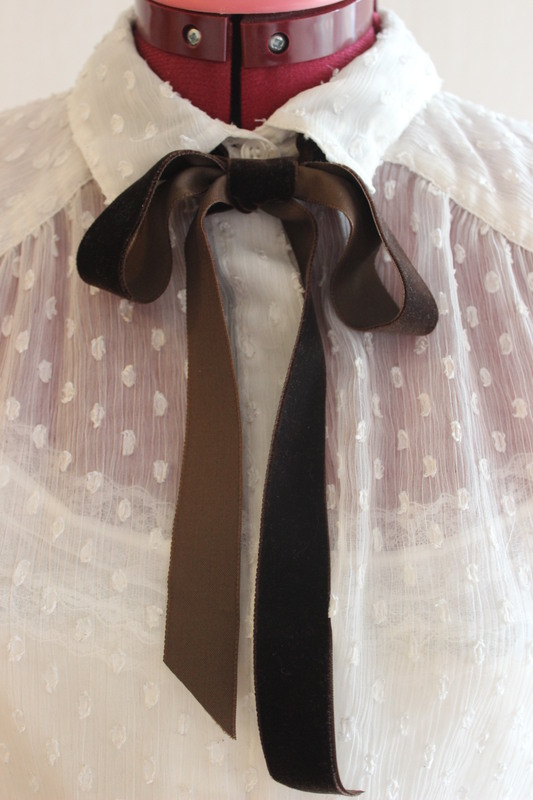 First worn: Will be worn for photos on October 4th. 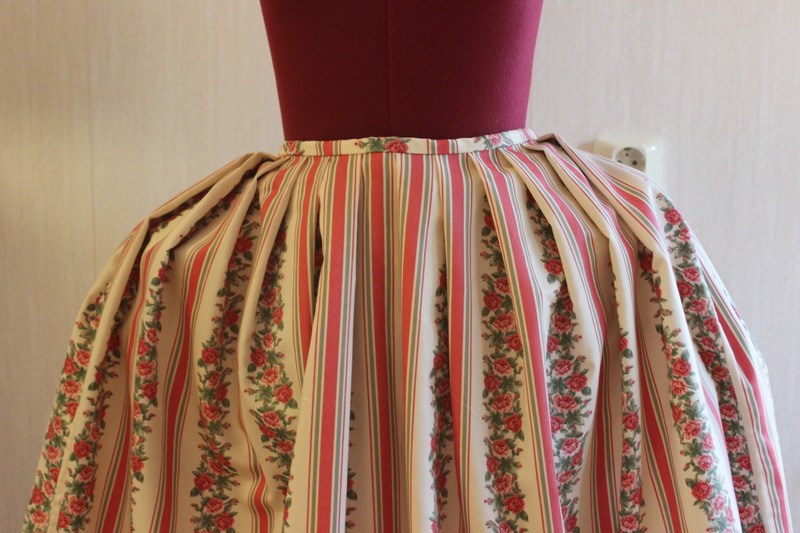 Final thoughts: I like how it came out, both the sweep of the skirt and the pattern matching looks really nice, but I’m not completely happy with the raised waistline and I might go back to tweak it a bit later on. 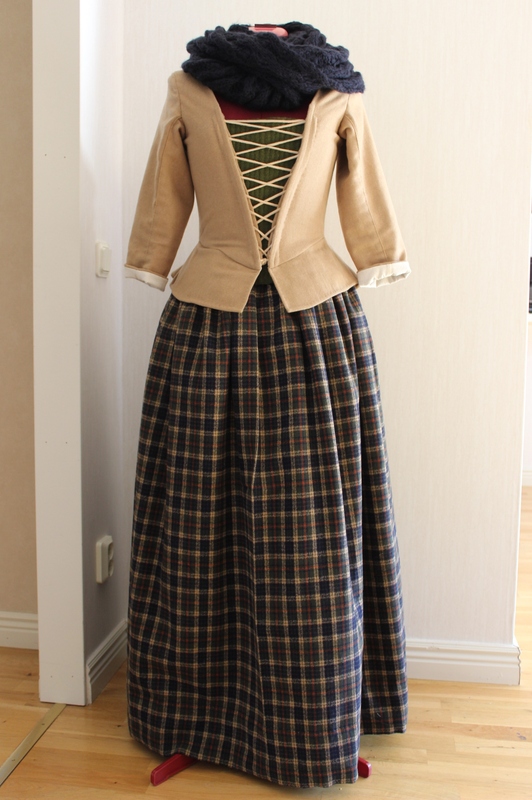 But a ll in all it’s a nice piece to have in the costume wardrobe. 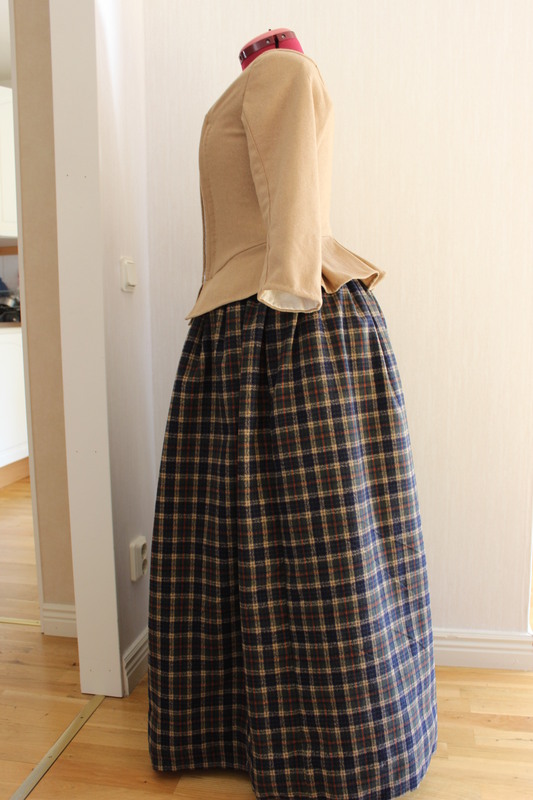 My well known love of fast progress made me decide to start the “Sew 17th century challenge” with one of the faster pieces – the skirt. 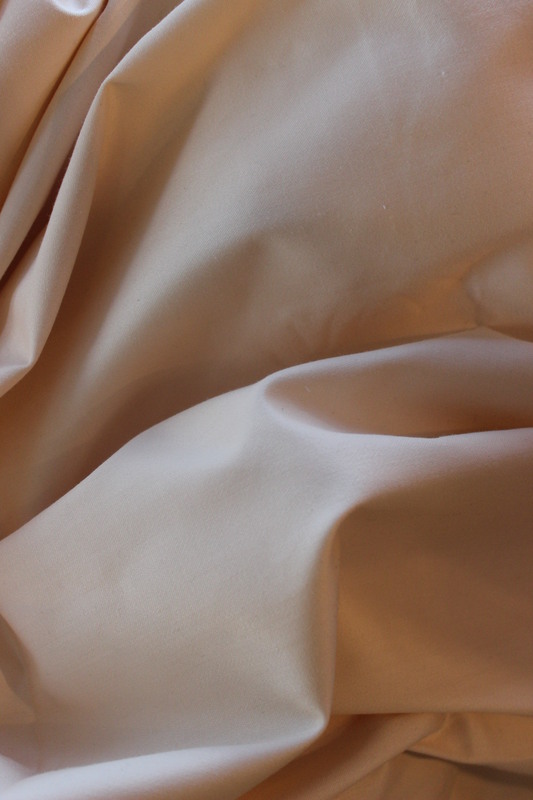 Staying true to my promise to avoid new fabric purchases, I choose a golden/beige satin from my stash. 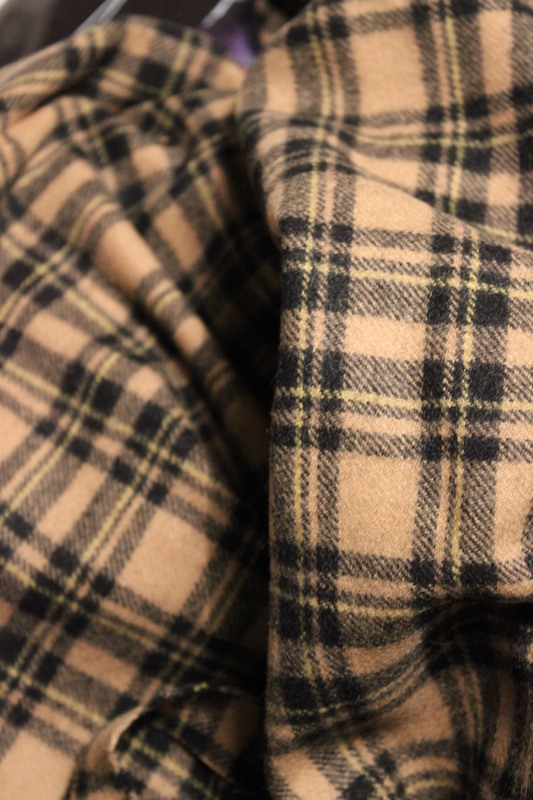 I’m not sure of the fabrics content but I would guess on a cotton/polyester blend. 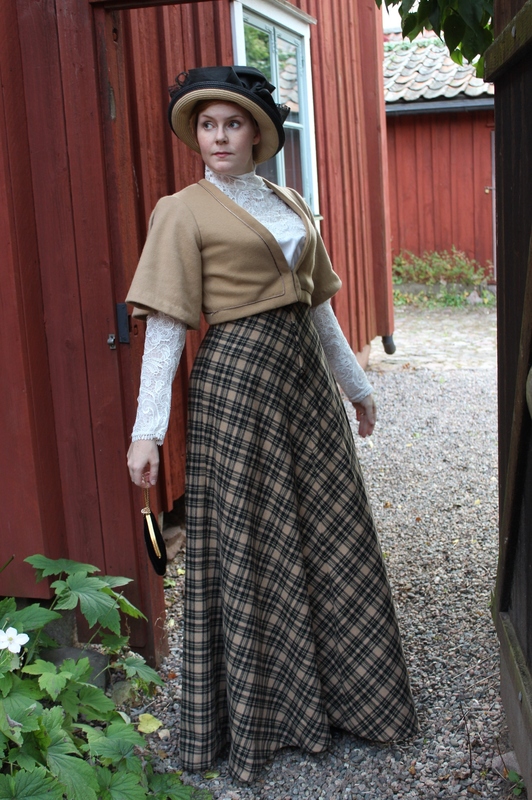 The fabric was gifted to me a few years ago and I saved it for something special – and I think this outfit more then qualify. 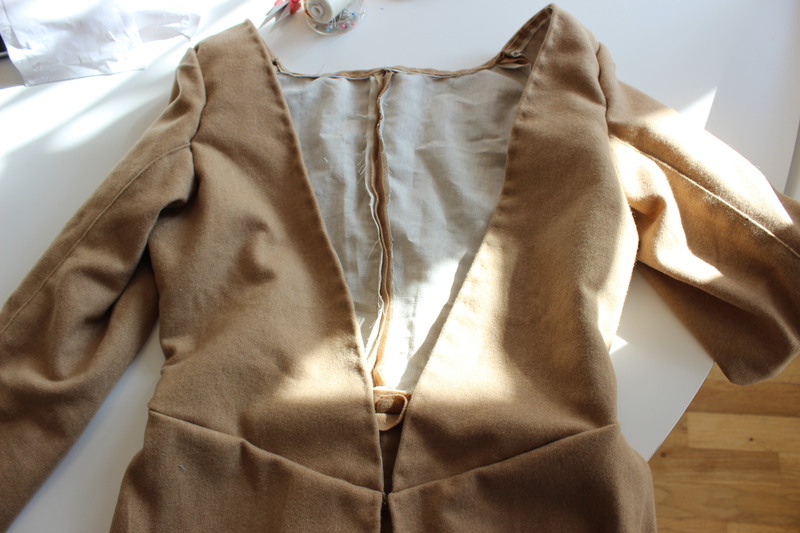 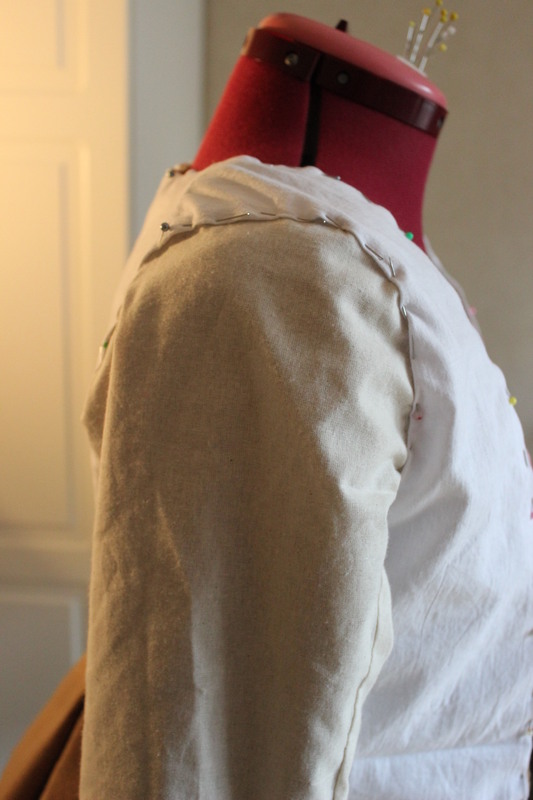 I even got enough left (after the skirt) to piece out a 17th century bodice at a later date. 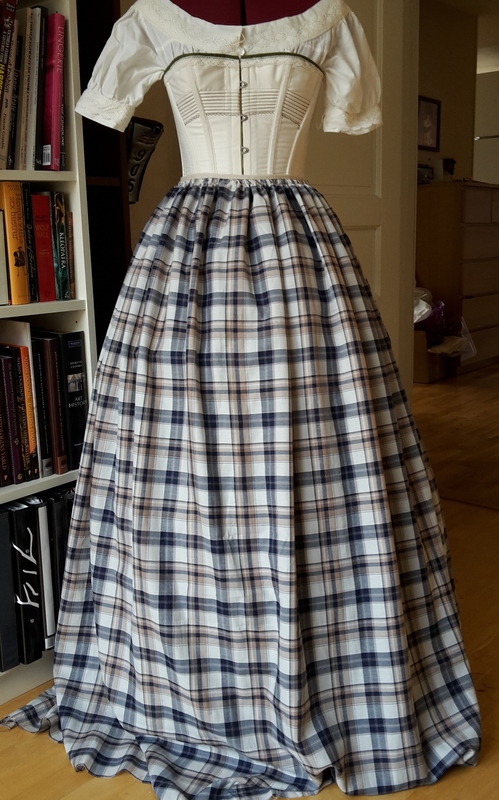 Without pattern, and with no particular help from the painting, I decided to copie the look of an extant 17th century skirt I’ve studied pictures of. 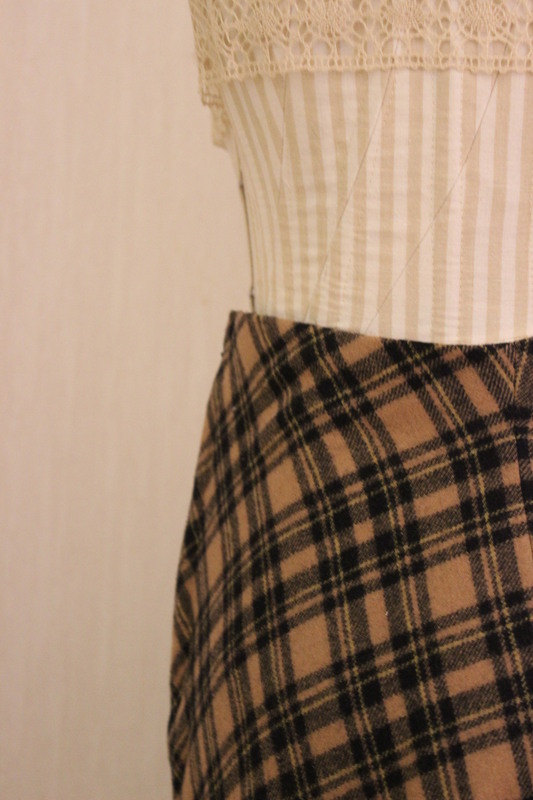 I started by cutting two skirt lengths of the fabric and stitched them together. 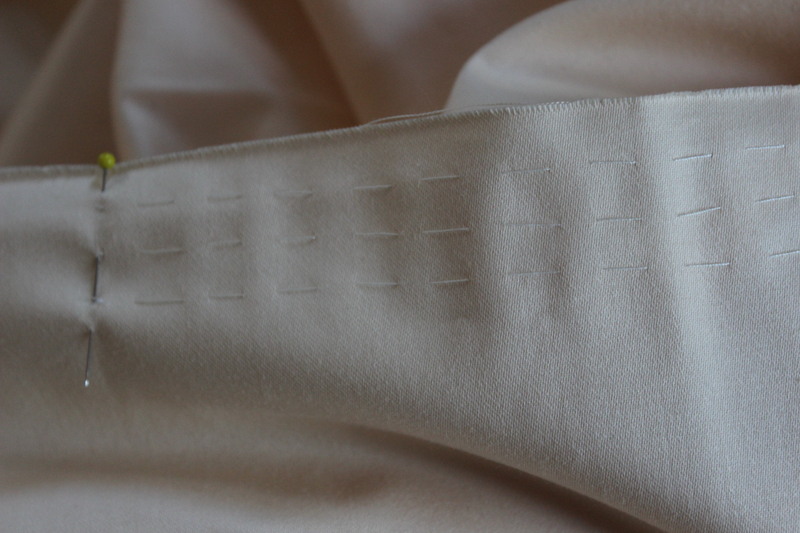 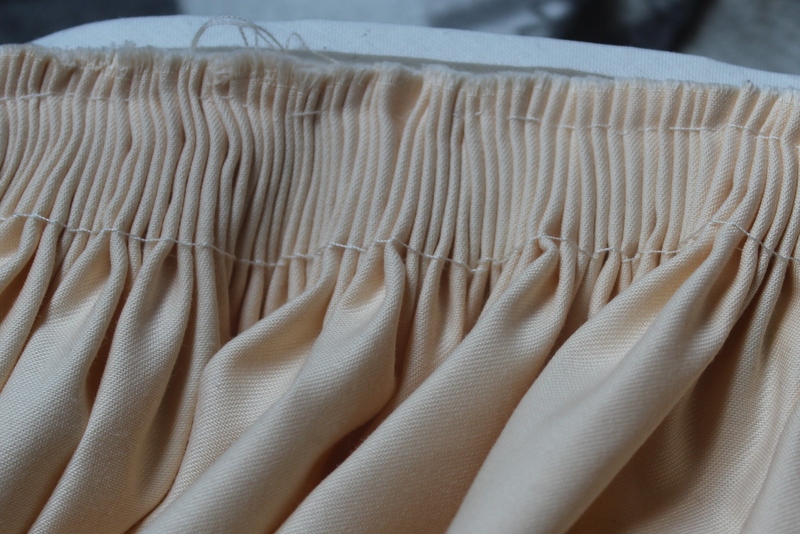 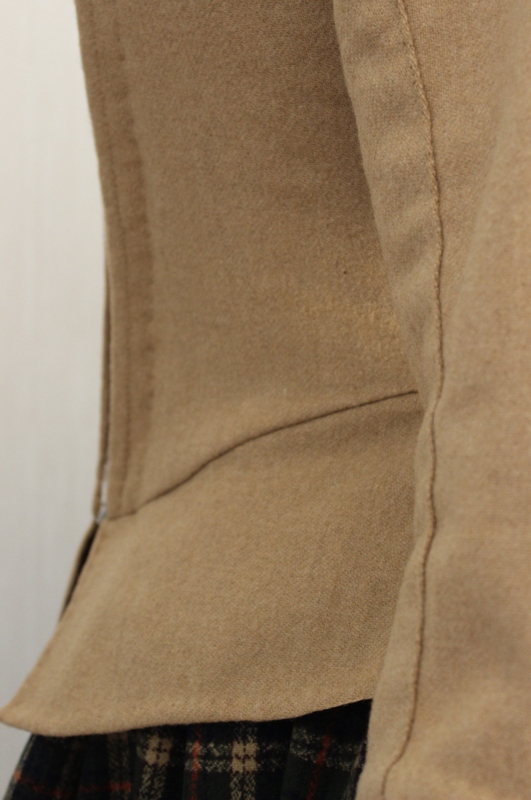 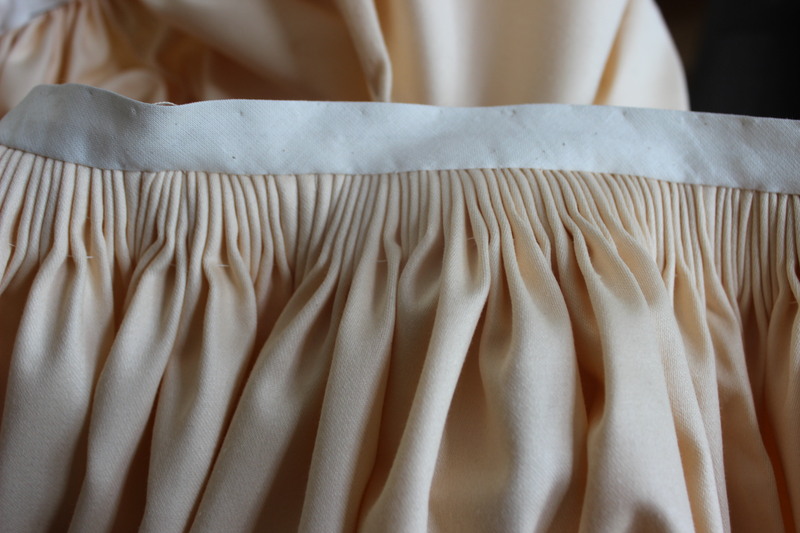 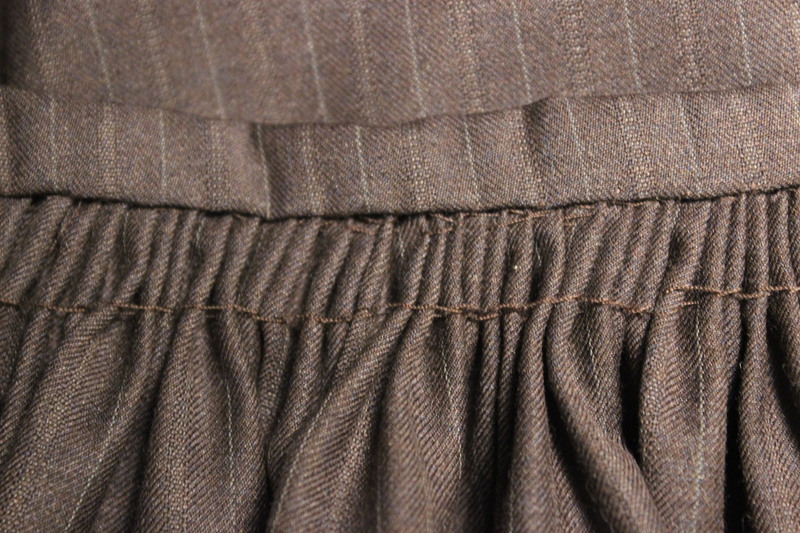 Then I hand basted three rows of spaced running stitch through the top edge, and pulled to create nice cartrige pleats. 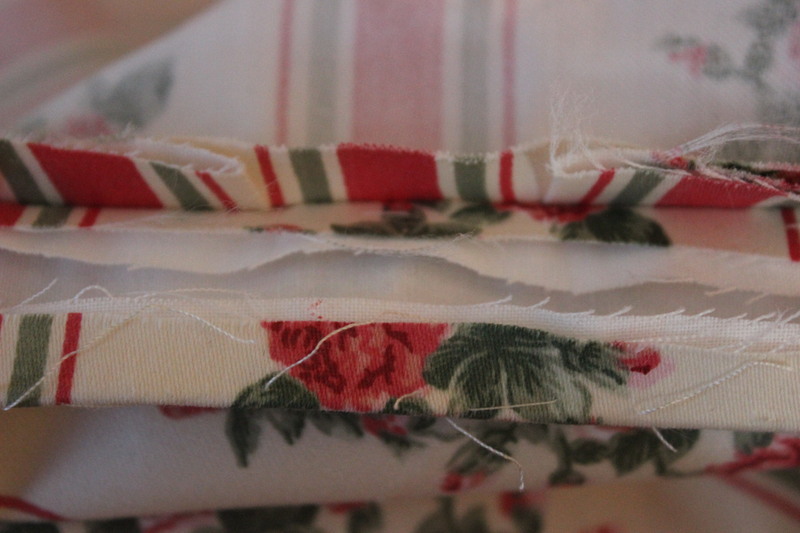 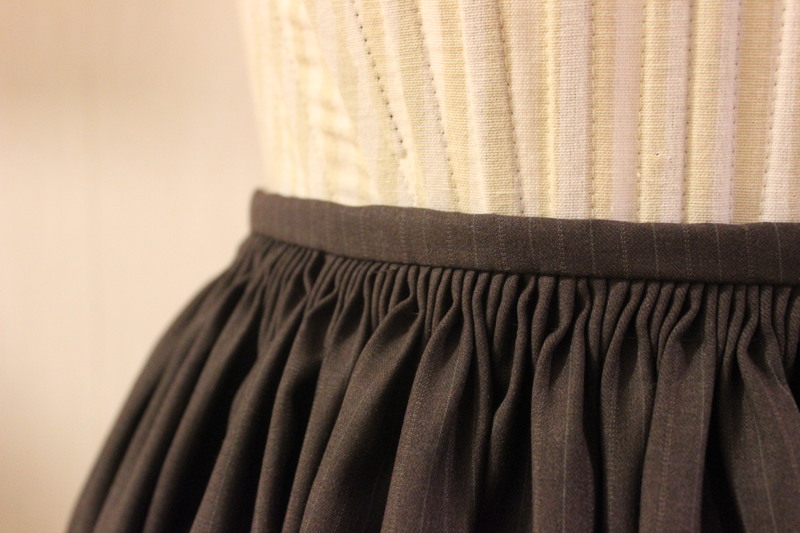 Then I cut a piece of bias tape and stitched it on over the gathers to create a waist band. 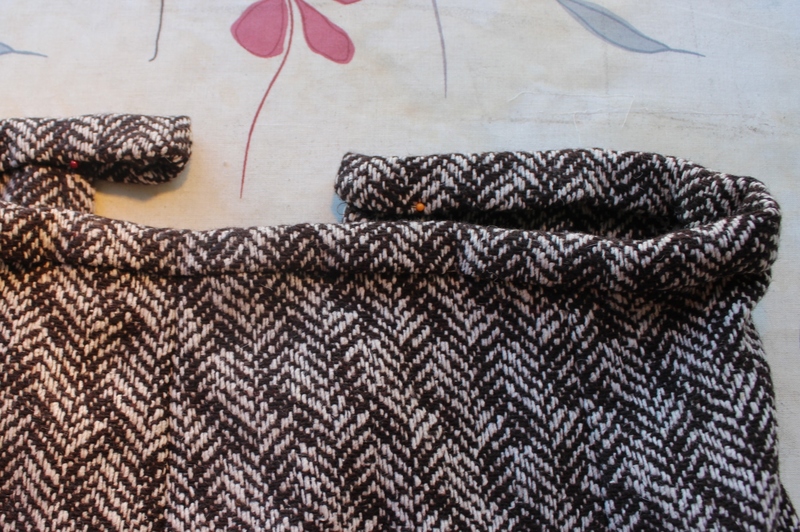 I had some debate on how to make the waistband and thous treat the bias tape. 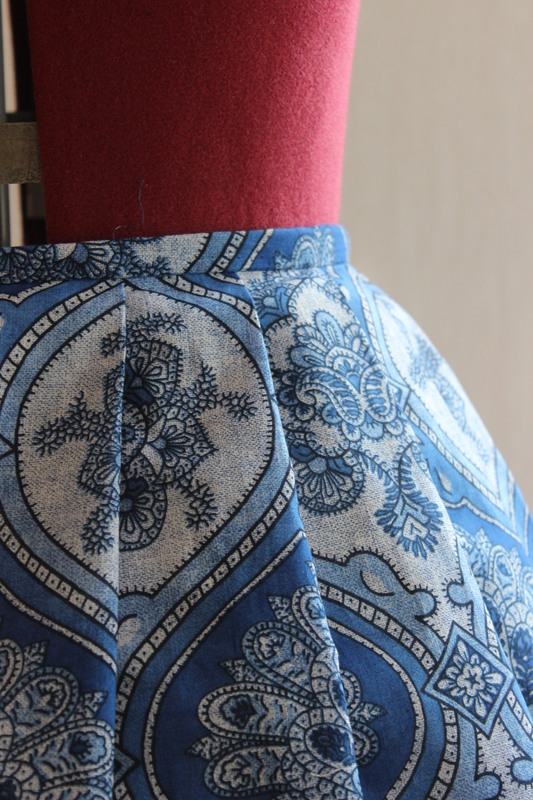 my first thought was to simply fold it over and tack it down to create a regular waistband. 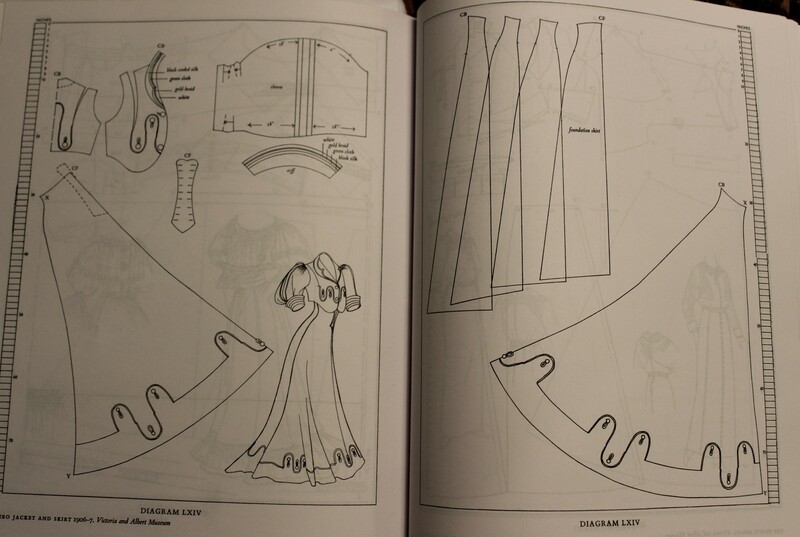 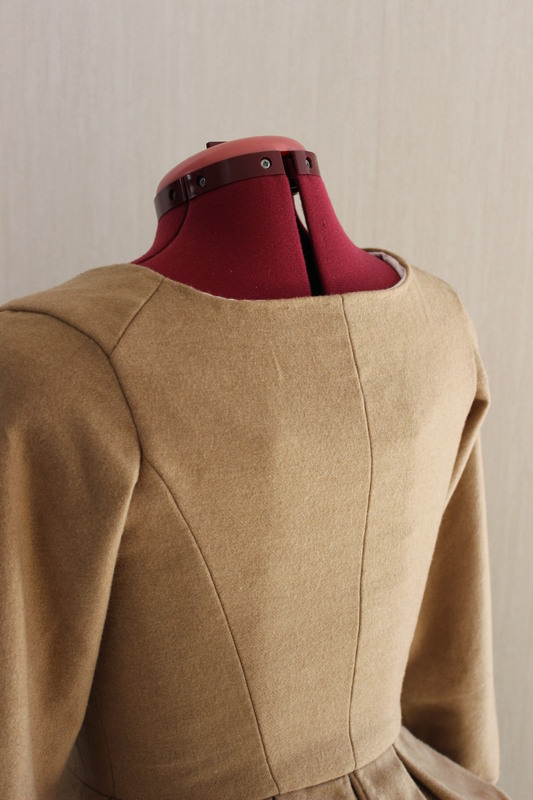 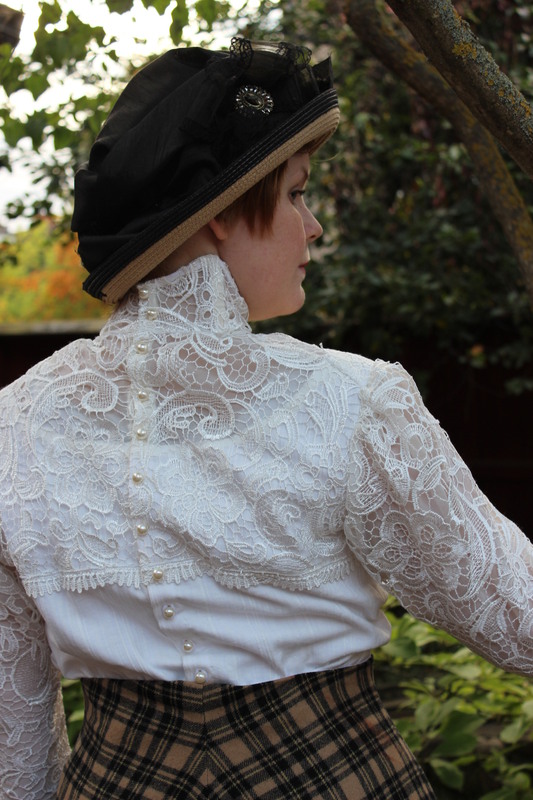 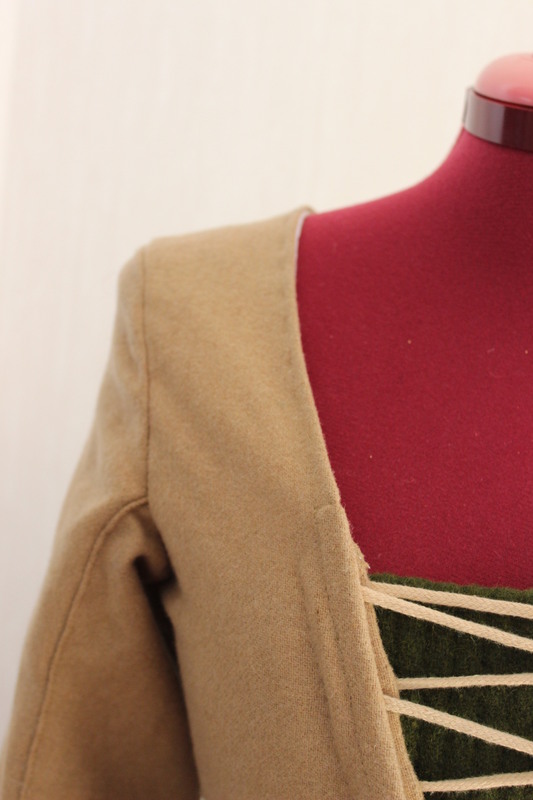 But then I started thinking – a visible waistband would work for this outfit since he bodice sits on the outside, but if I ever wanted to make a matching beige evening bodice the tabs needed to be tucked inside and thous show the waistband. 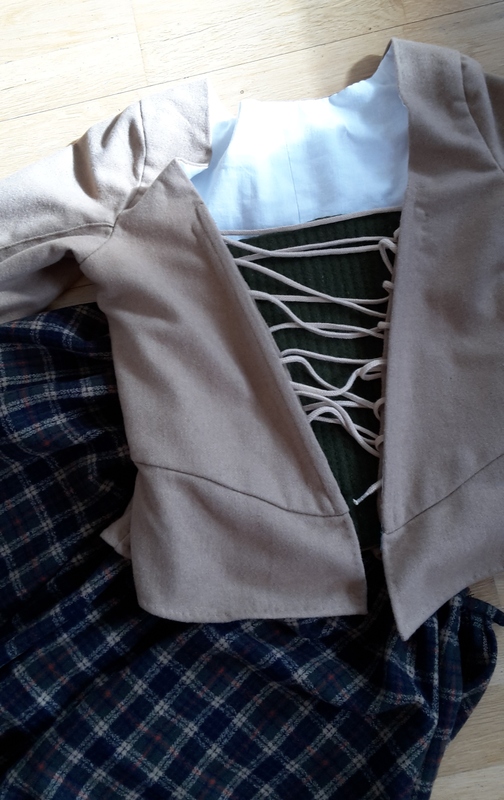 Not so good. 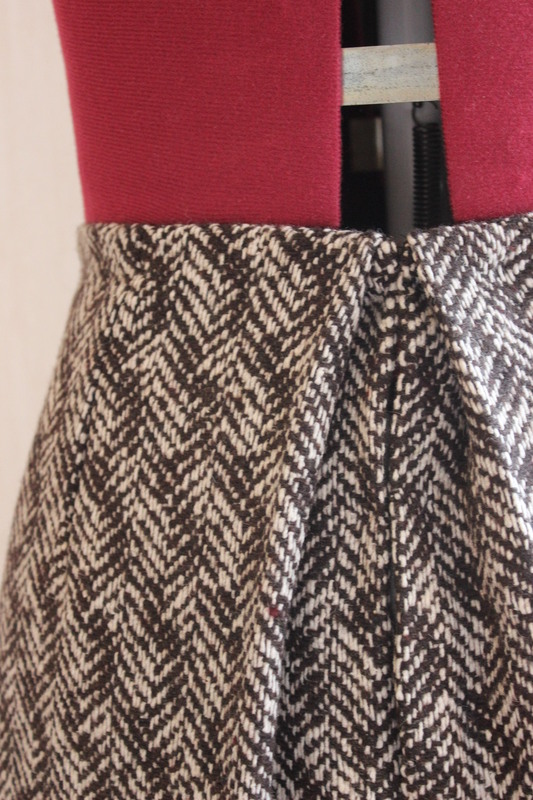 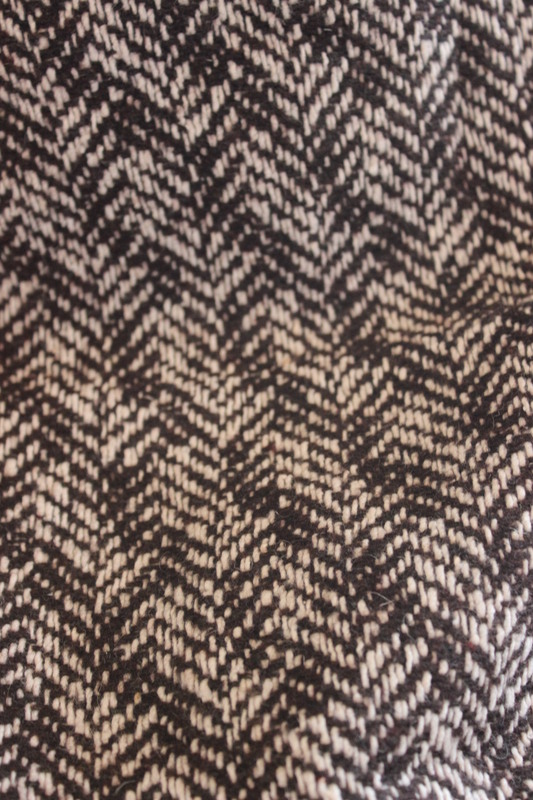 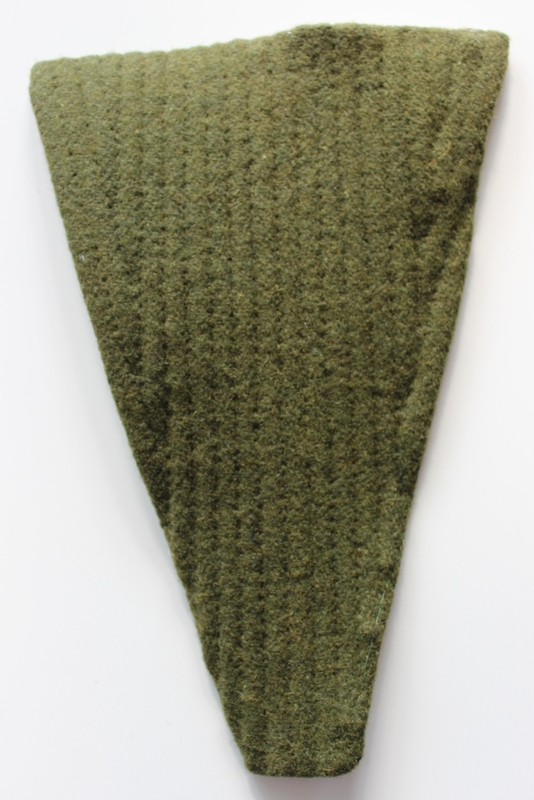 Pattern: None – just two rectangles gathered a the waist. 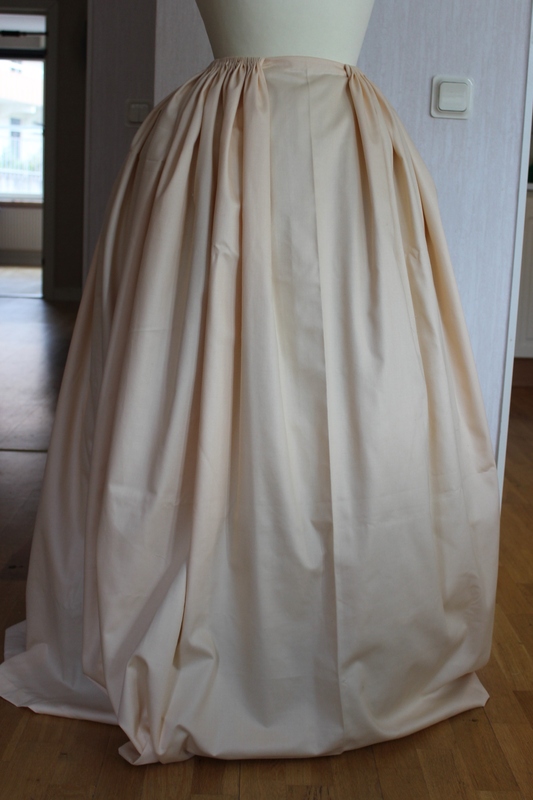 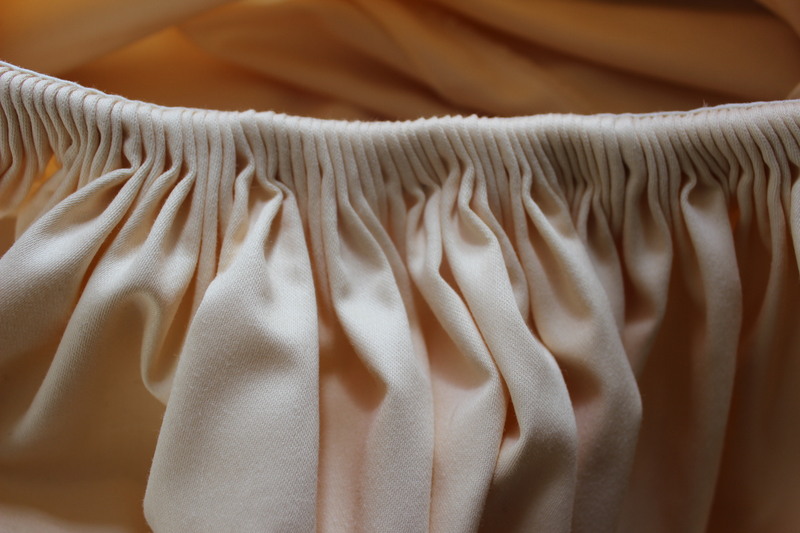 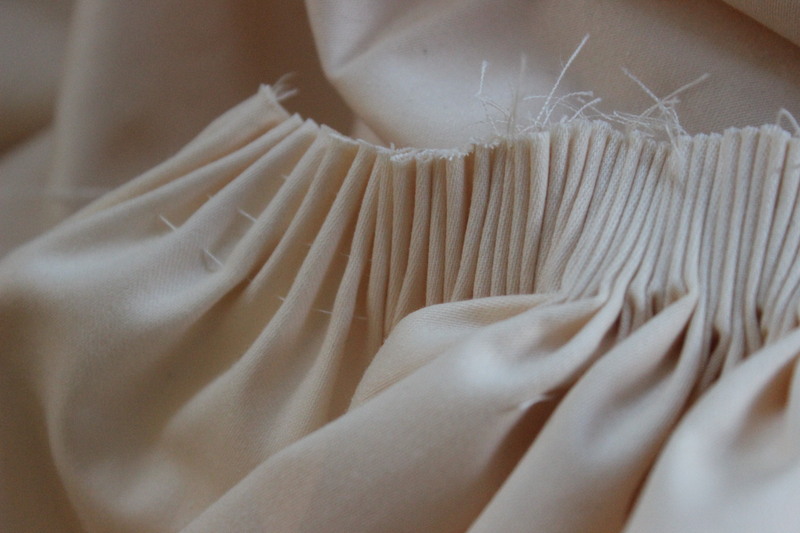 Fabric & Notions: 2,5 m of cream polyester satin, thread, 1 m bias tape, hook and eye. 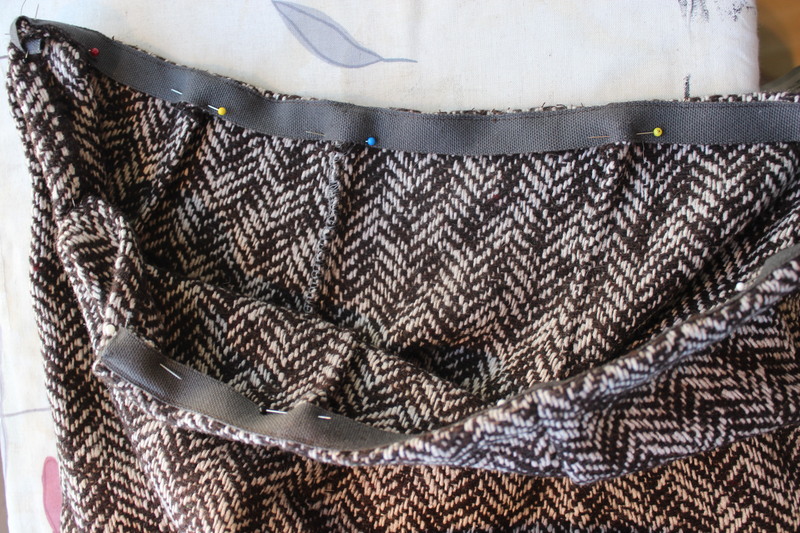 Final thoughts: I’m not sure the bias-tape waistband was such a good idea – the waist seems to be growing for each try on. 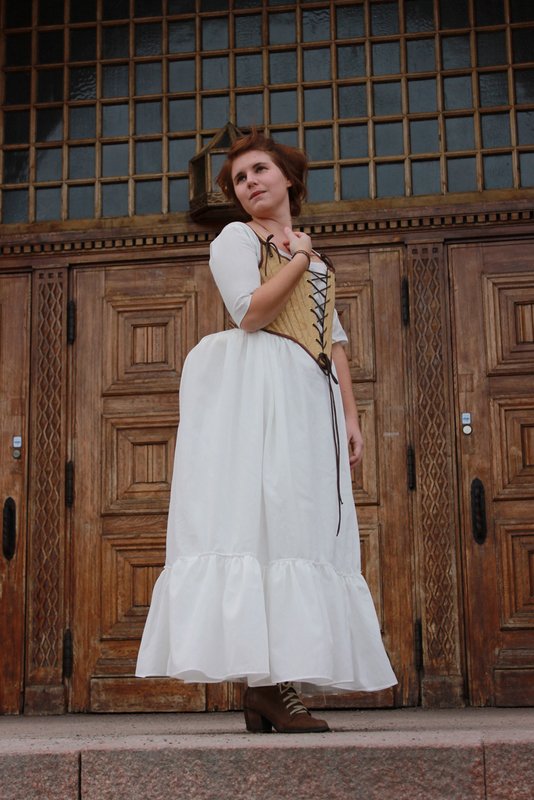 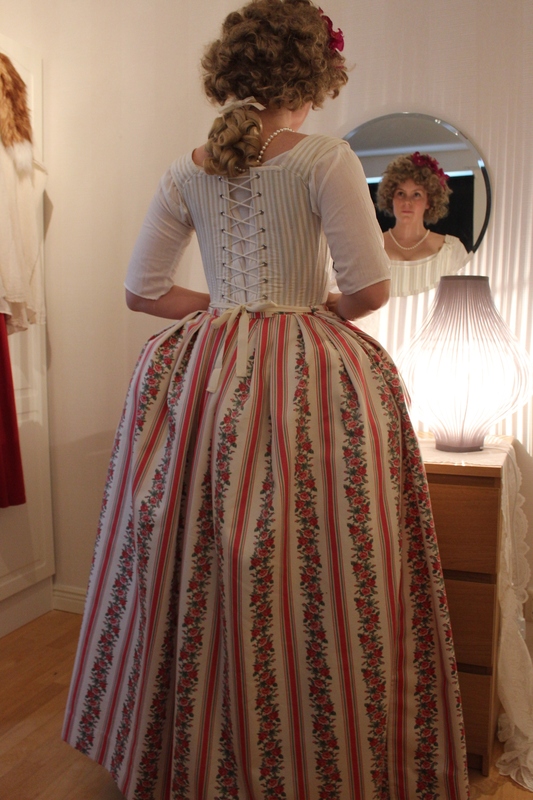 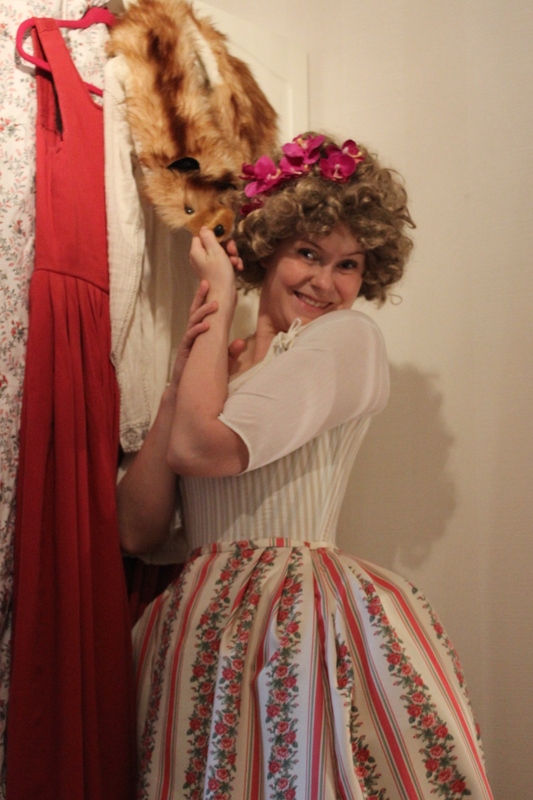 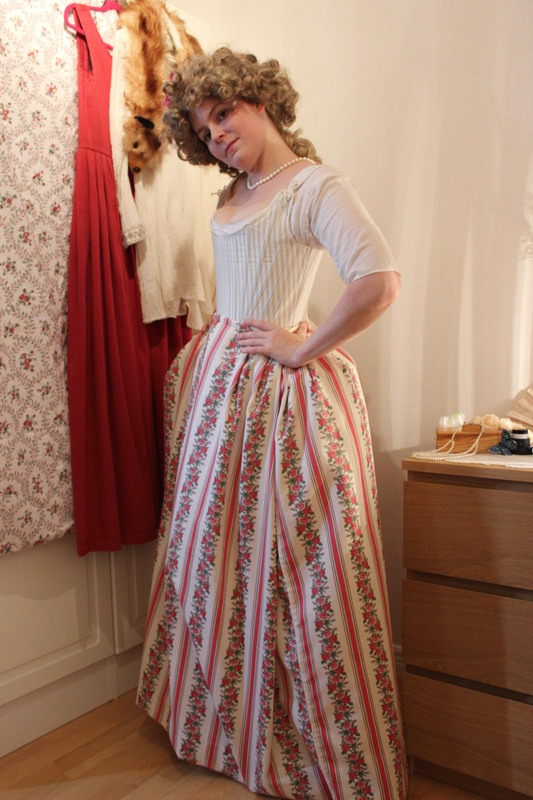 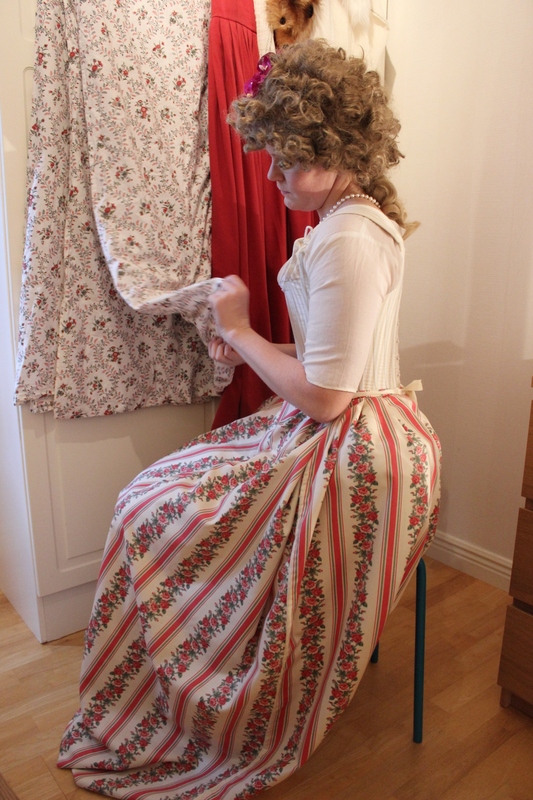 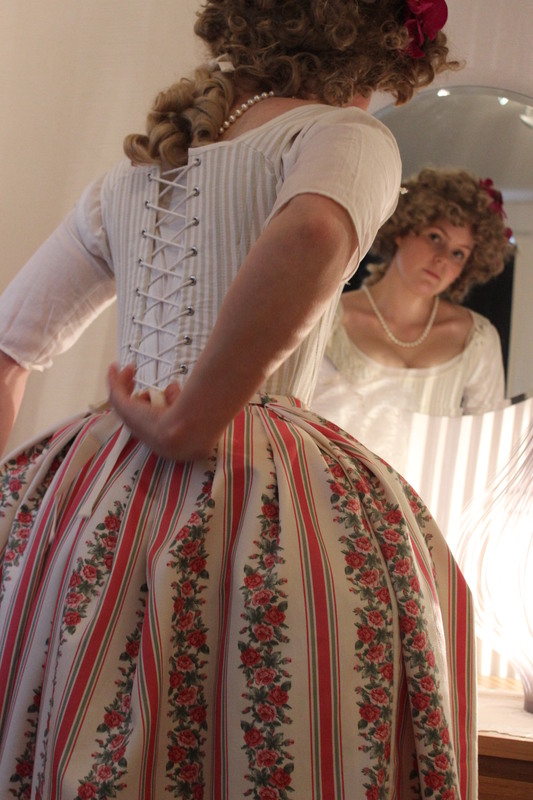 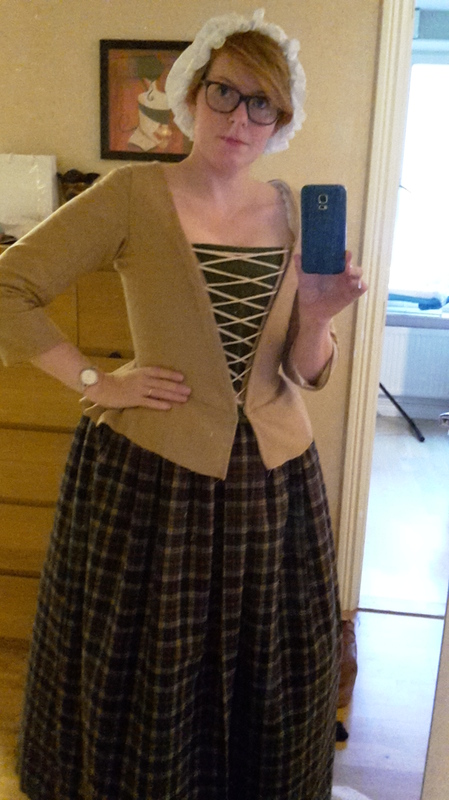 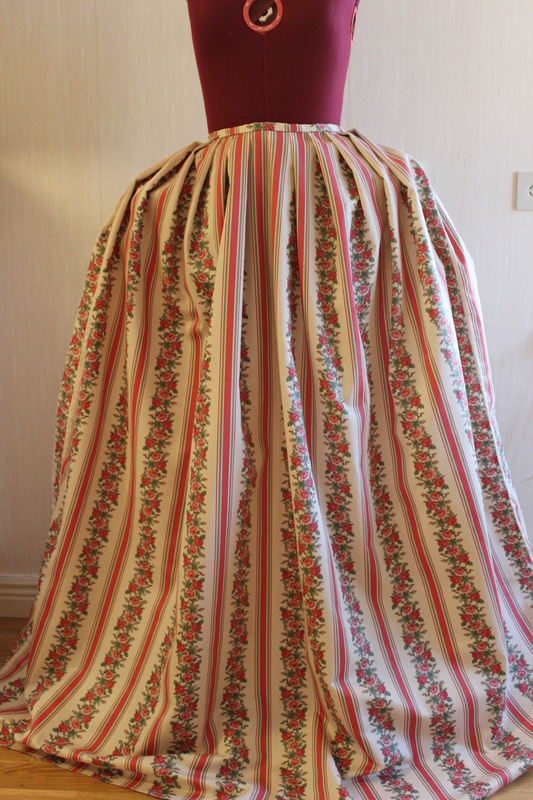 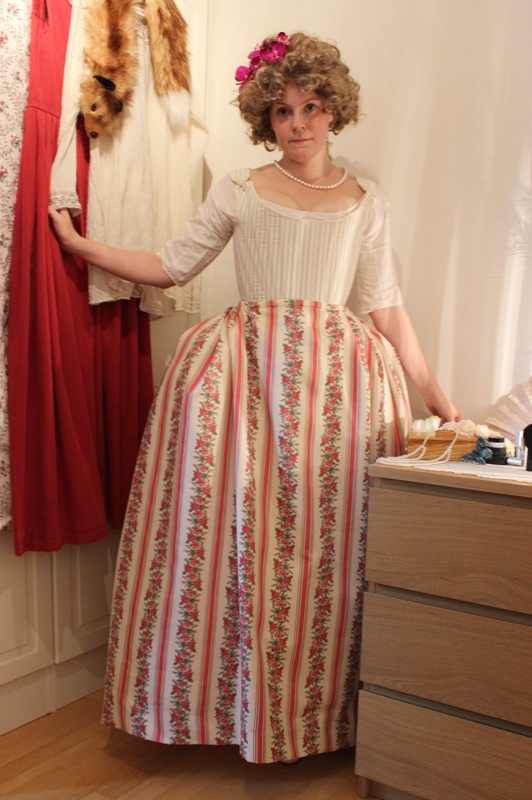 Last weekend I’ve made a 18th century petticoat/skirt. 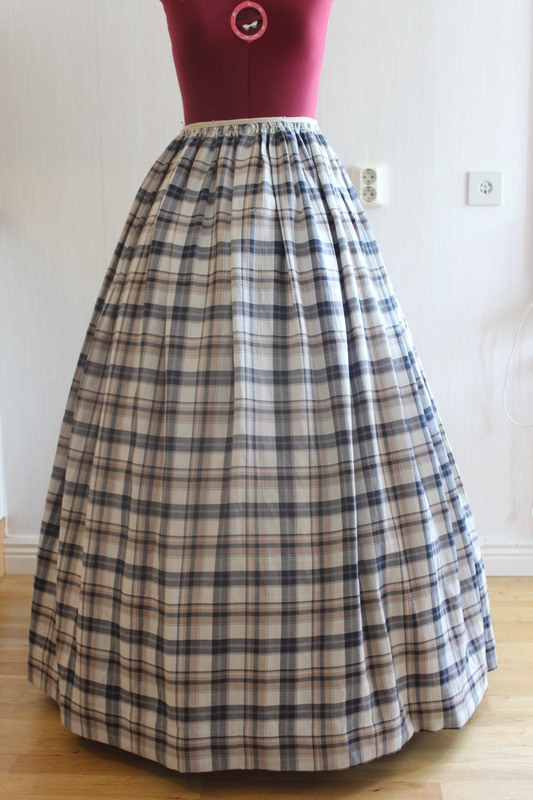 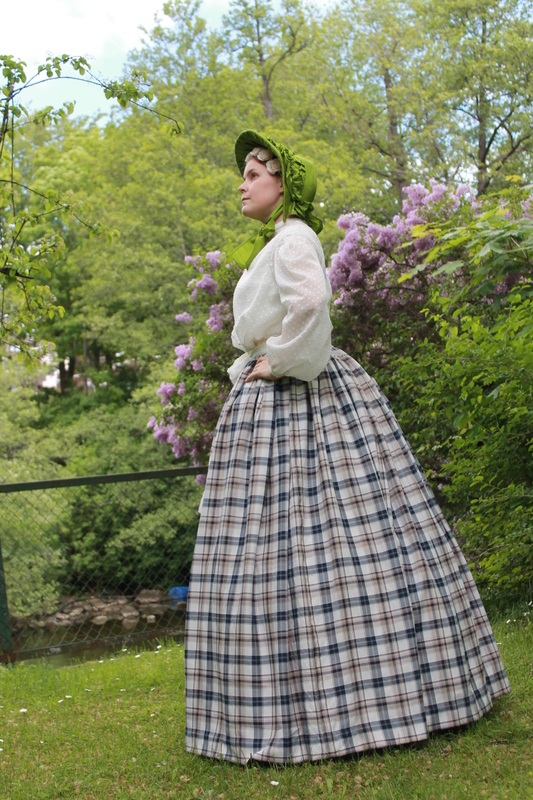 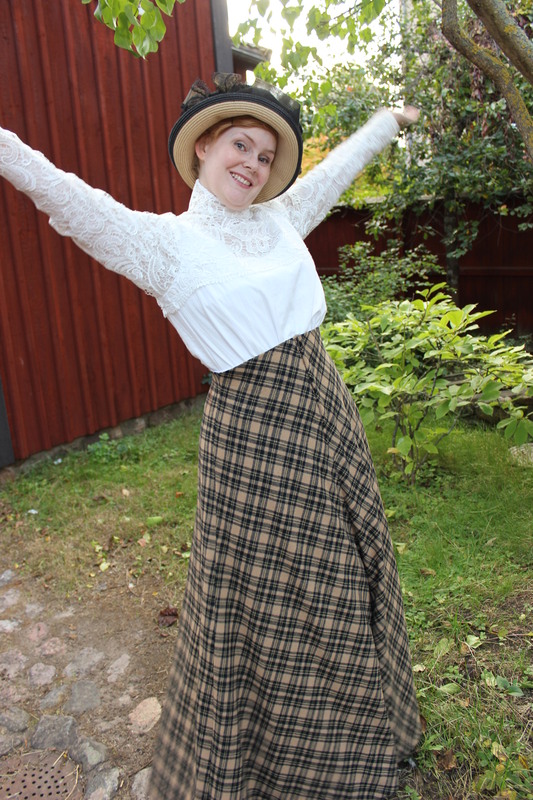 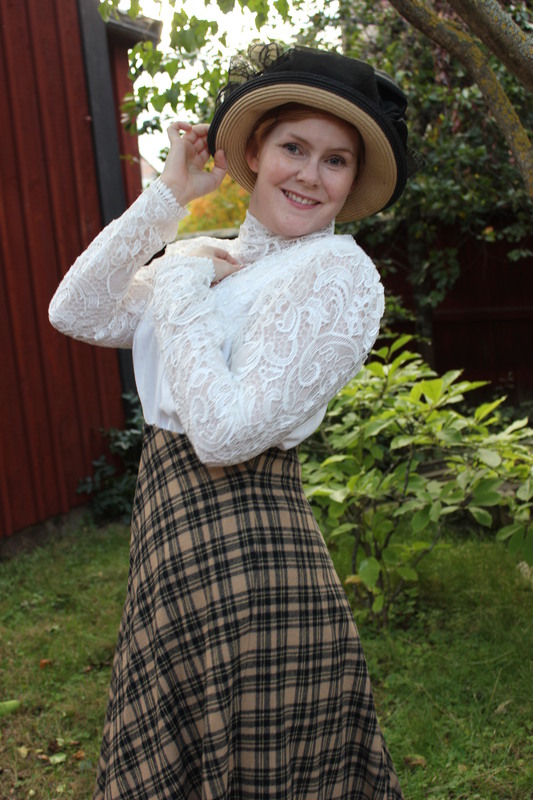 Here in Sweden “Petticoat” means – “under skirt” or hoop-skirt if you’r talking wedding dresses, and a skirt is just a skirt – nothing else. 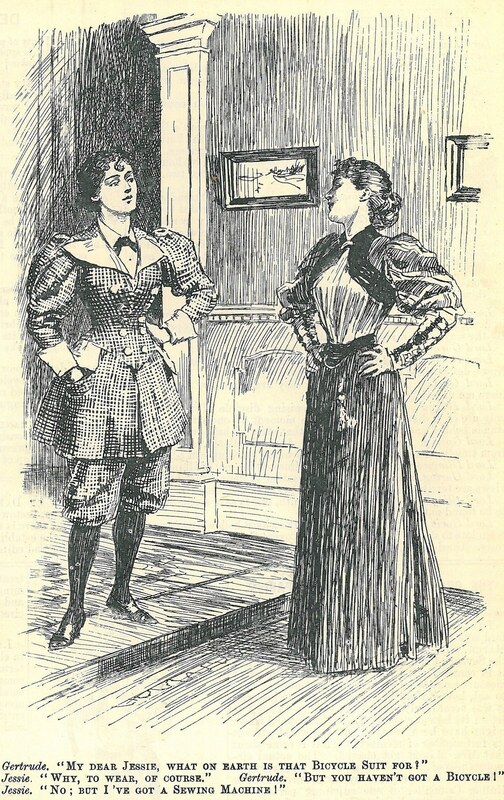 But in historic sentence these two seems to be interchangeable (at least to me, since I’d always had a bit trouble keeping the two apart in English). 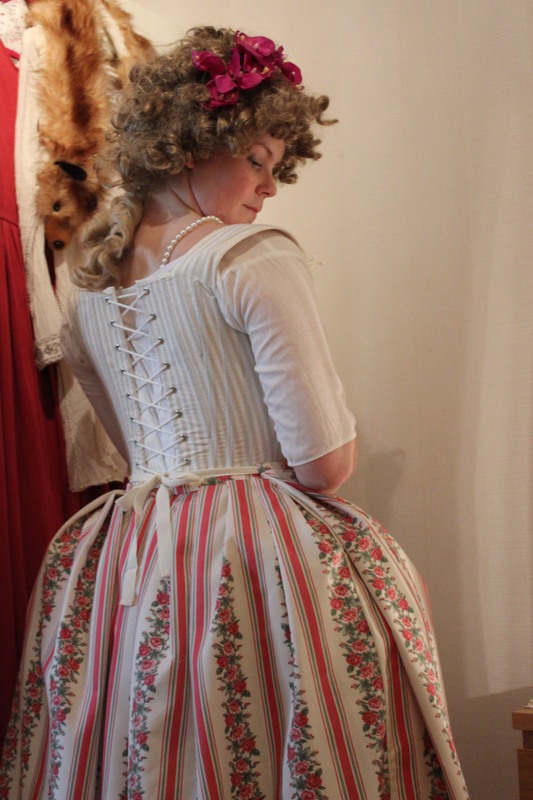 But I then I read in “Cut of womens clothes” that after 1660s “the underskirt was always called a petticoat”. 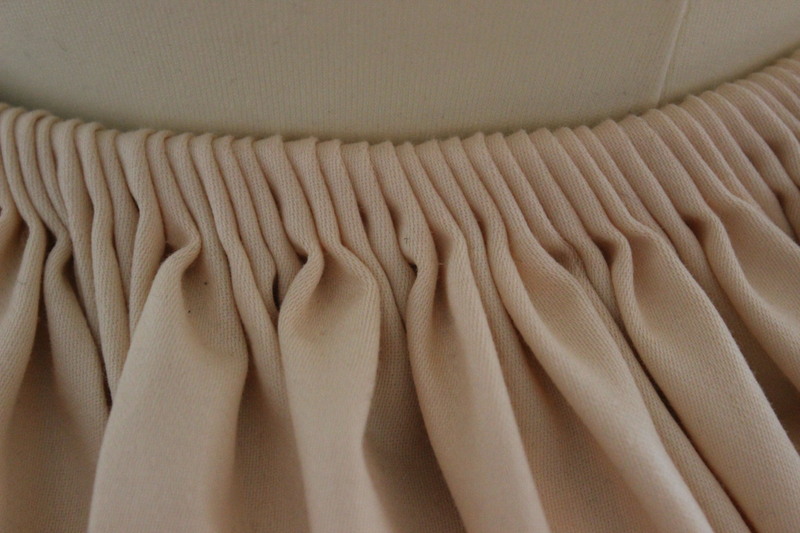 Does that mean you can call the same garment “skirt” or “petticoat” deepening on the way it is worn at the moment? 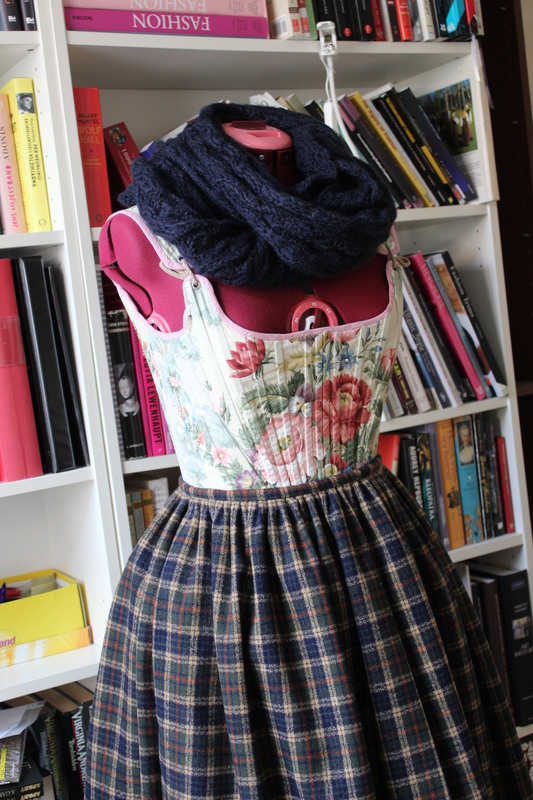 I’t was such an easy and quick project even though I made it by hand. 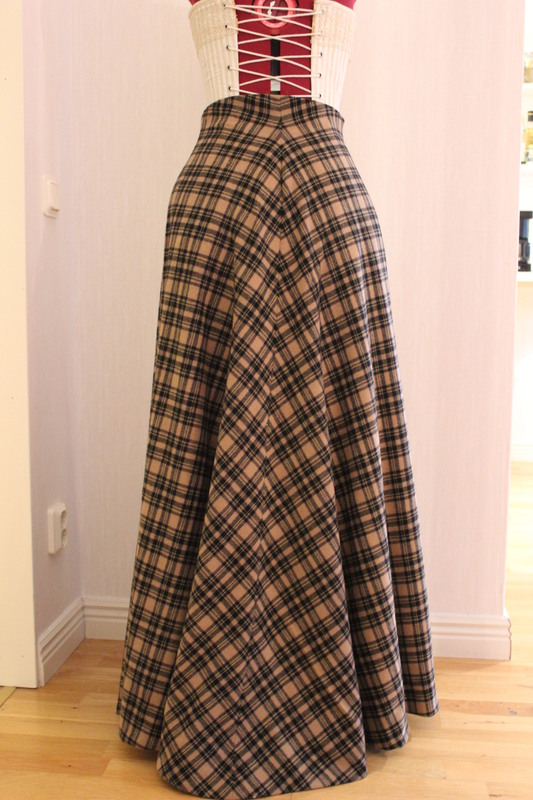 One day in front of the computer watching series, and it was done. 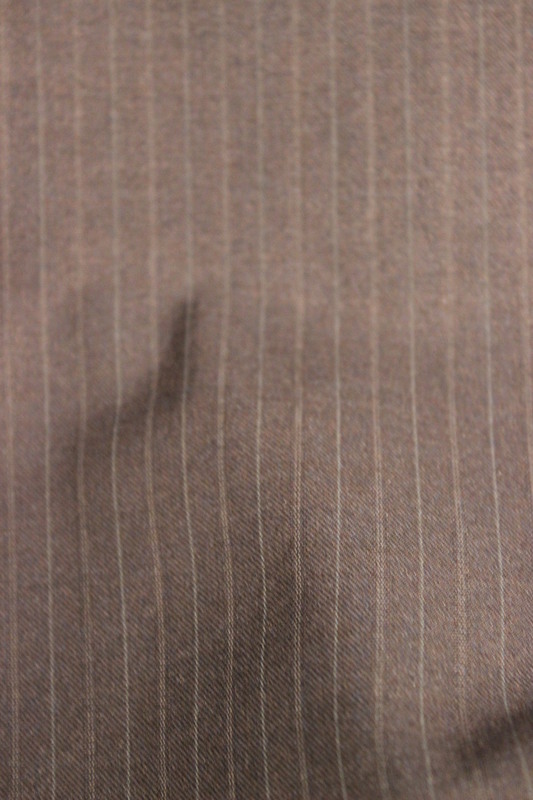 I bought this brown fabric for a steal from an online fabric sale – convinced it was a striped cotton twill (as the website claimed). 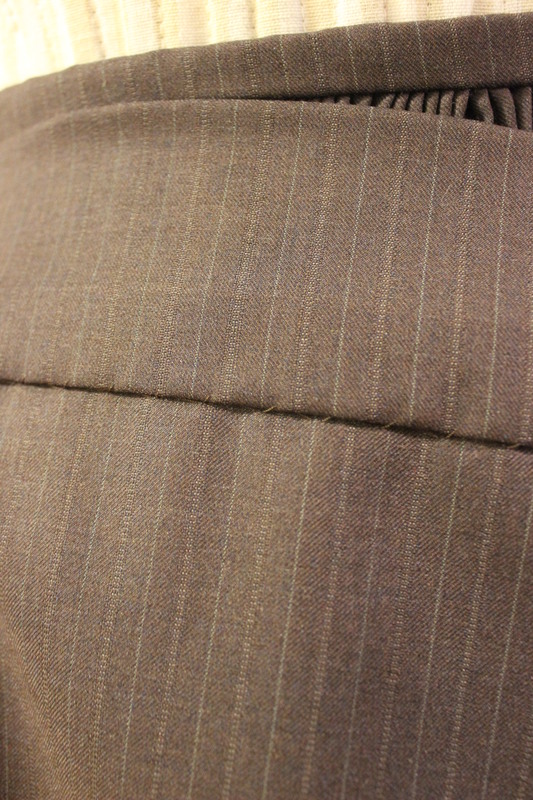 But once delivered it was more like a heavy polyester made for suits and pants. 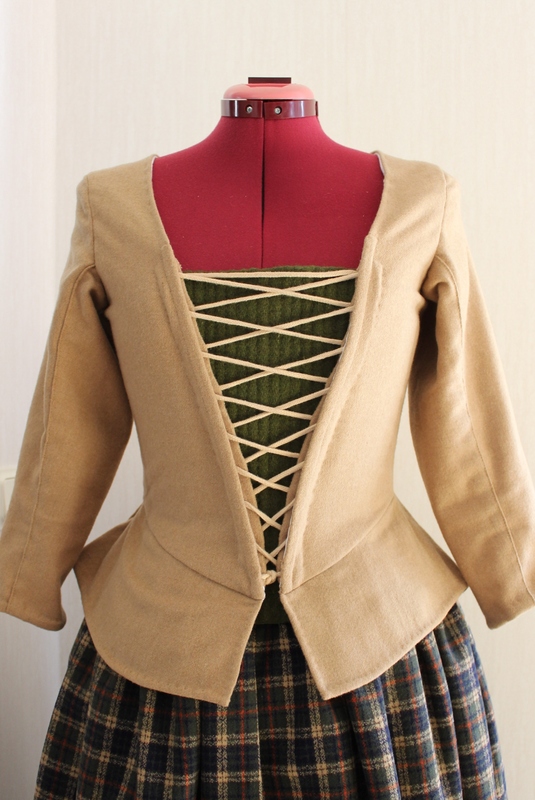 Darn it. 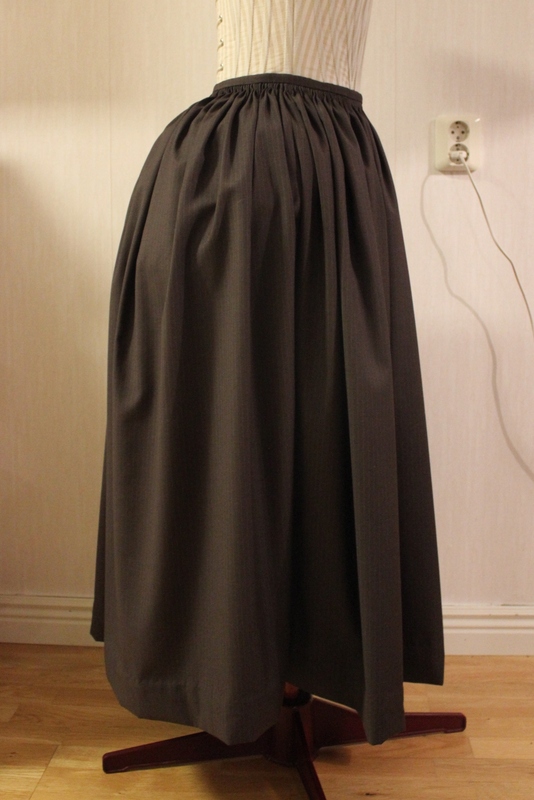 Well, the price of sending it back would be more then the fabric itself, so I decided to go ahead and make my skirt anyway. 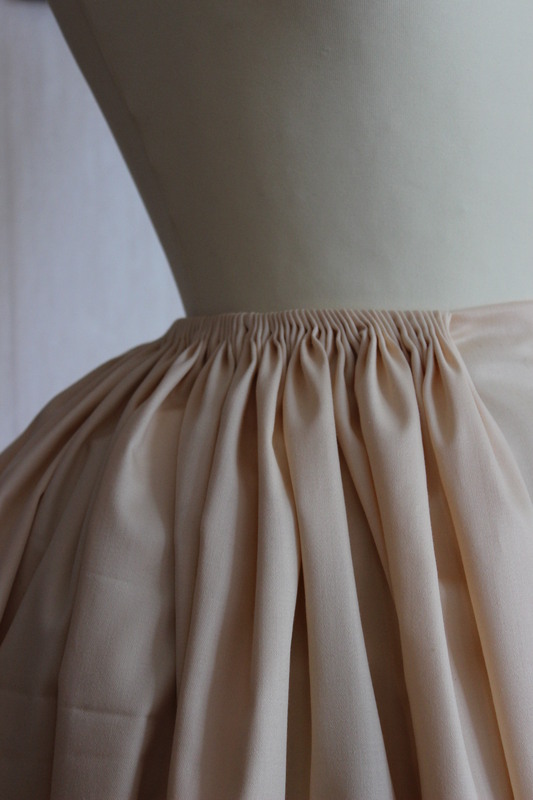 It worked surprisingly well, if you don’t count the bump in my fingers from pressing the needle through, and the heaviness of the fabric gives the skirt and hem a nice drape. 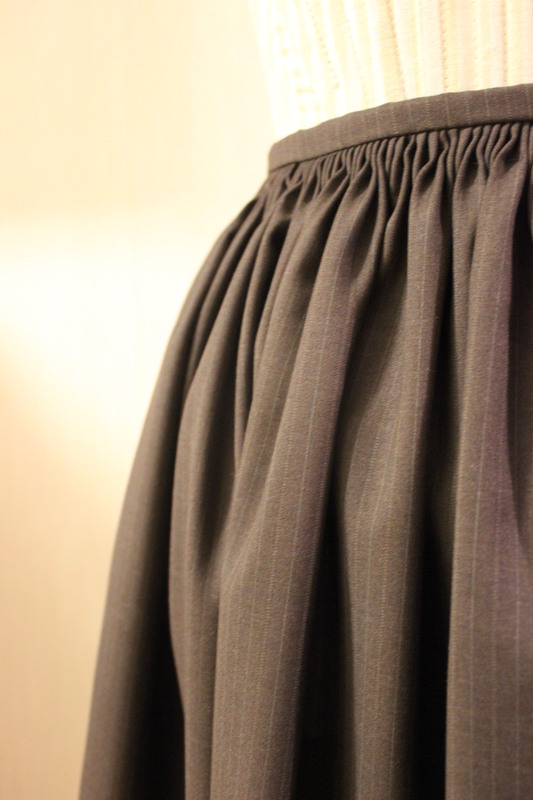 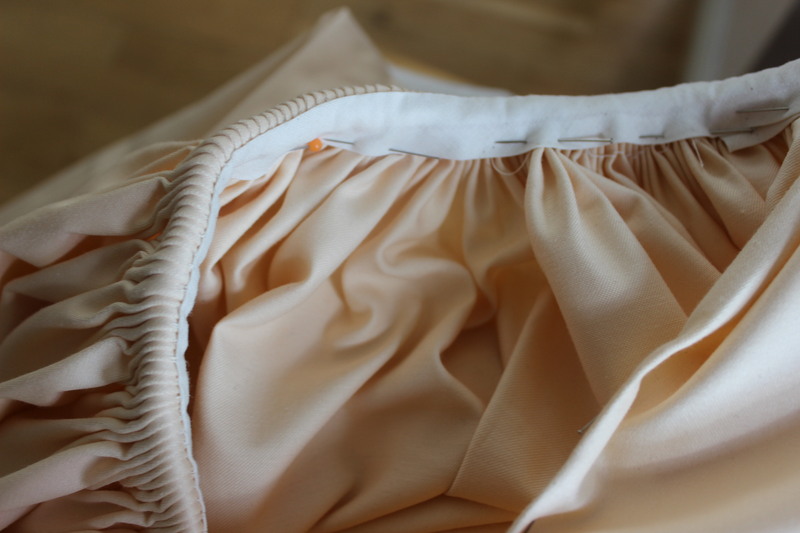 The construction is really simple using two width of fabrics and cartridge-pleating them to a narrow waistband. 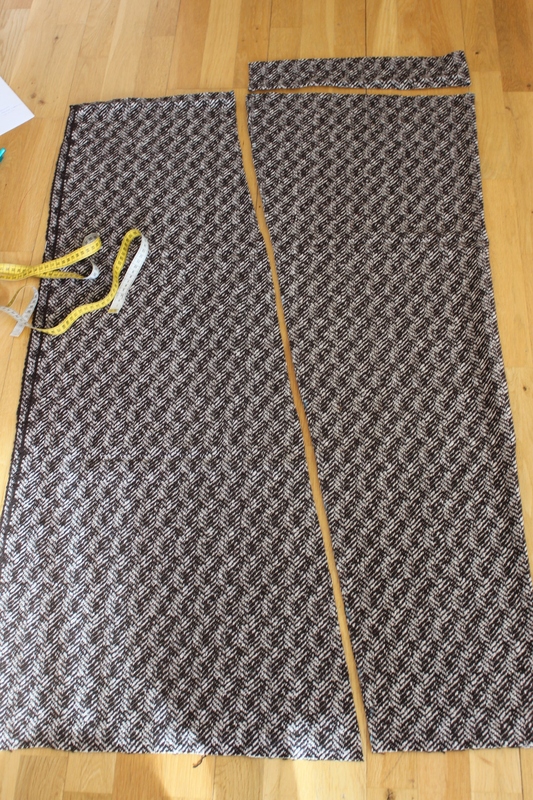 I also made sure to hem it quite short, to mimic the length of the fashion plate. 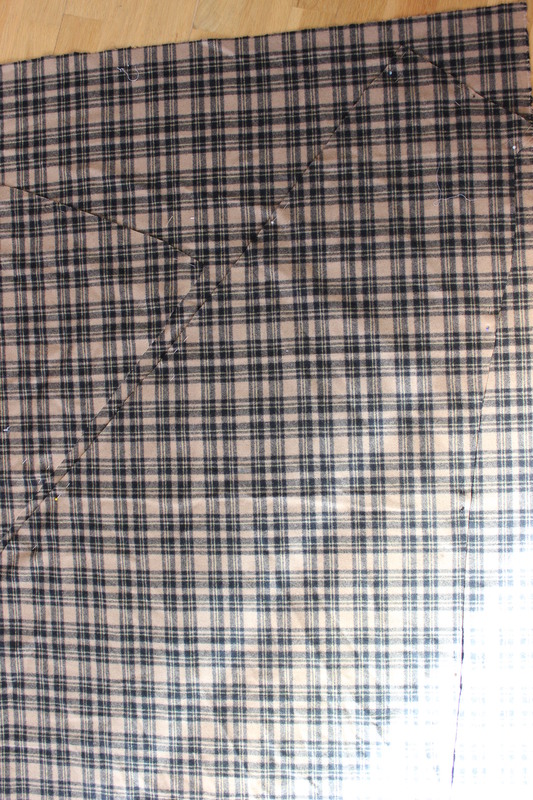 Time: About 5 hours of hand stitching. 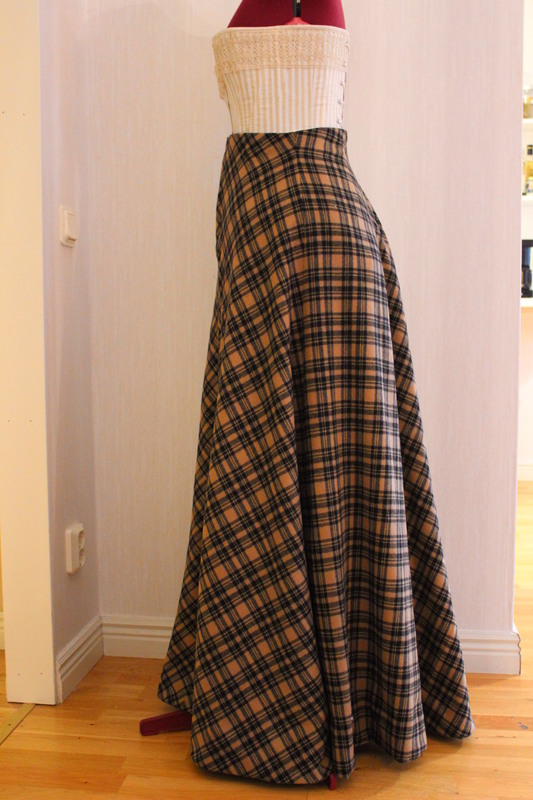 Final thought: I like the drape of the skirt and the pleating looks really nit, even though I would have wished for a thicker fabric. 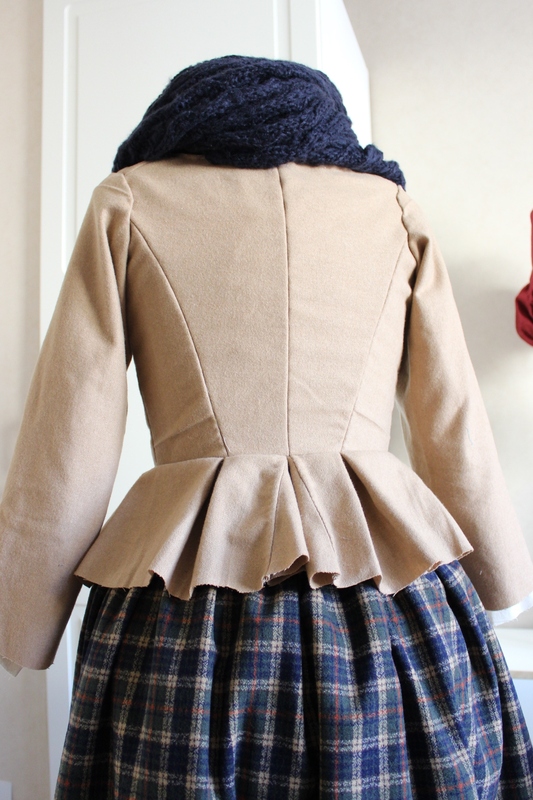 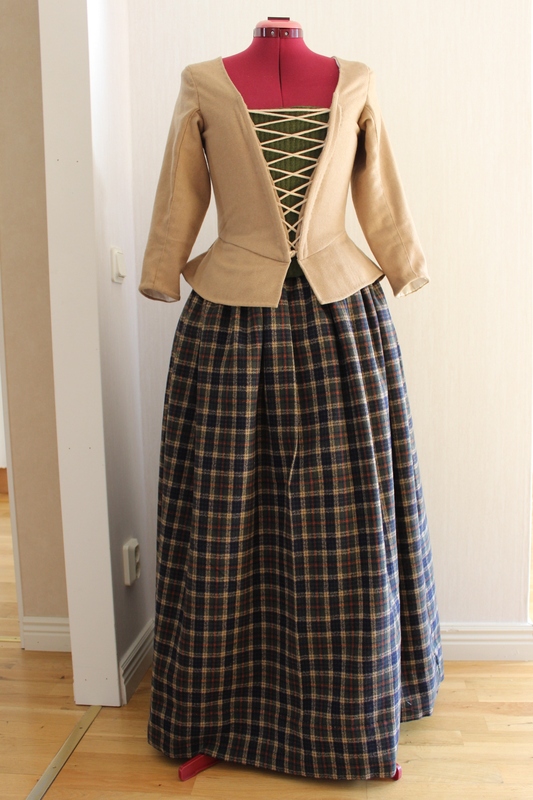 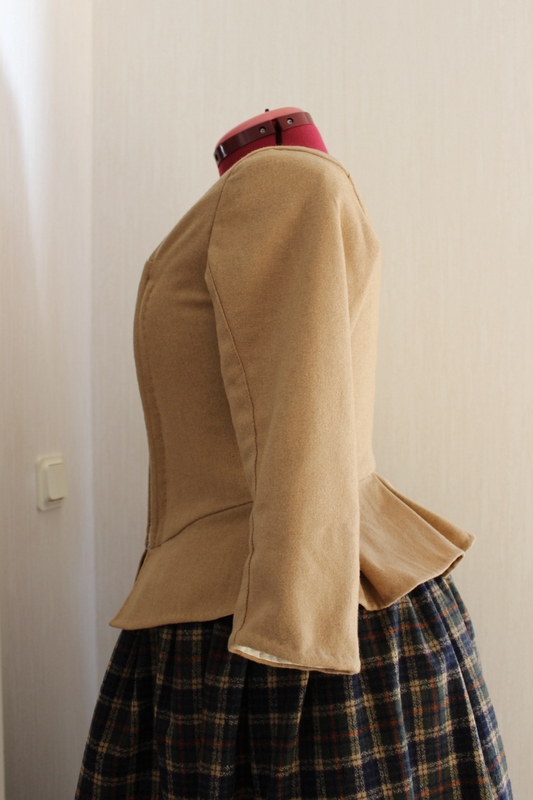 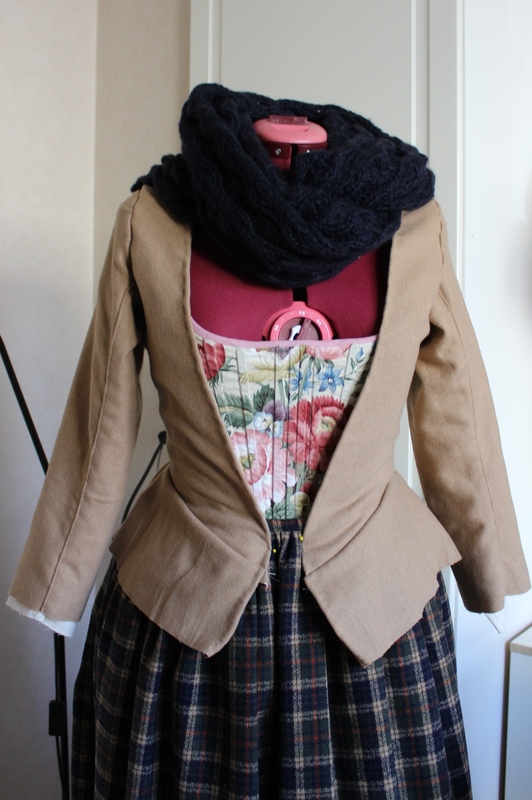 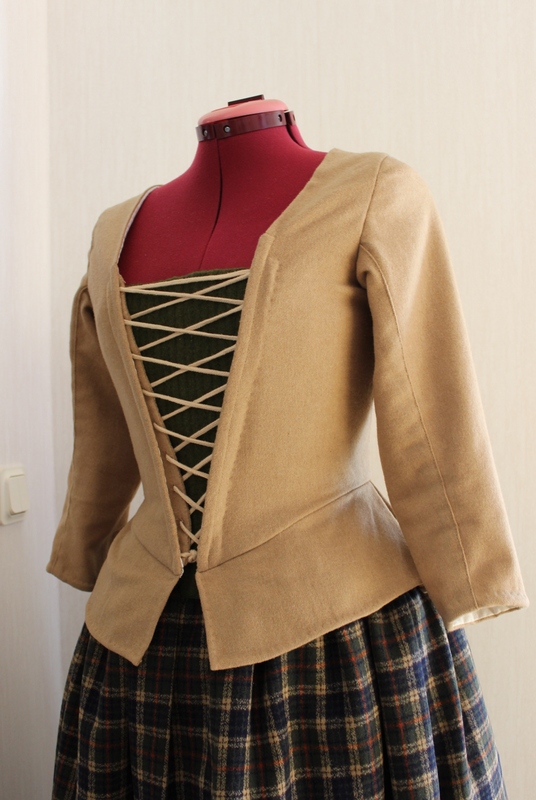 I think the skirt will look great combined with the new bodice/jacket and accessories I’m working on, for the “peasant fiest” I’m hoping to attend in about two weeks. 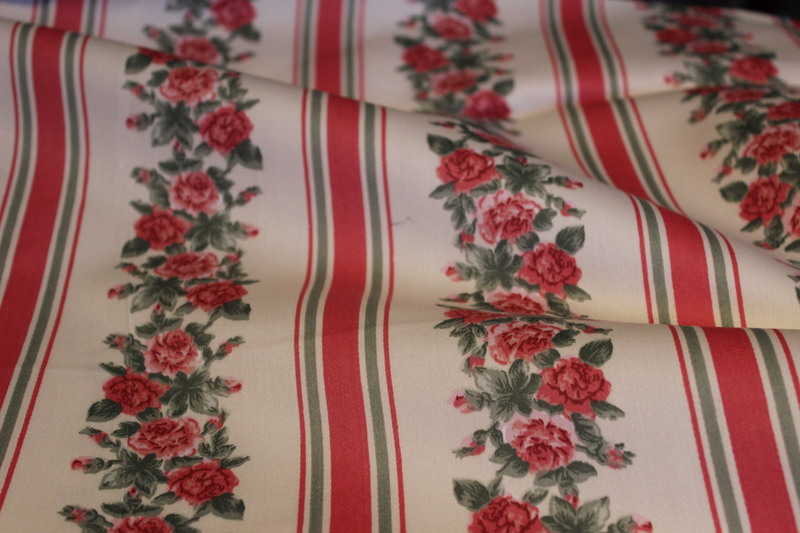 This summer, when venturing trough the local fabric store, I couldn’t resist buying this beautiful flowery satin fabric. 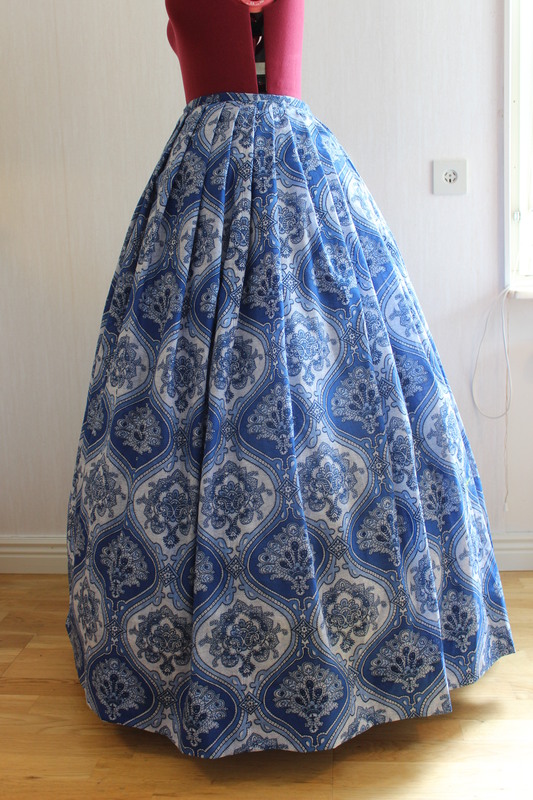 It just screamed at me from the sales corner, and begged me to make it into a robe a la Francaise – so I bought it all. 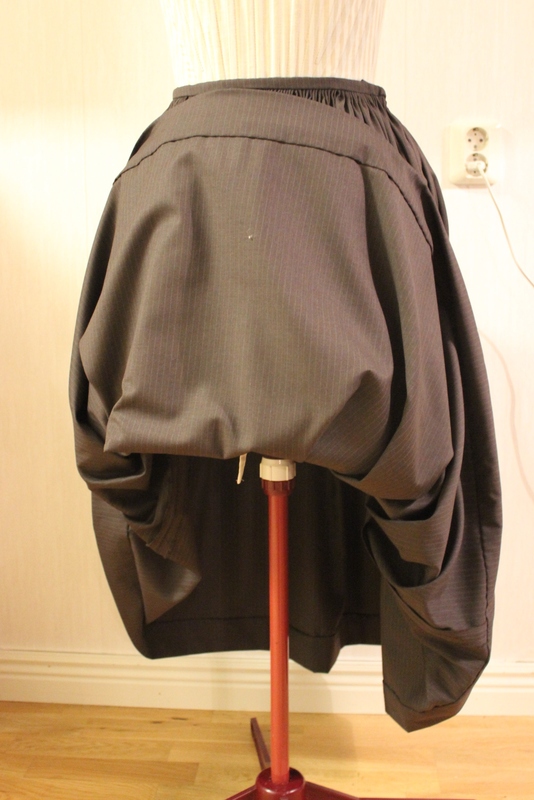 And since the this weeks HSF challenge nr 19) is “Poetry”, I figured I’ll start working on it. 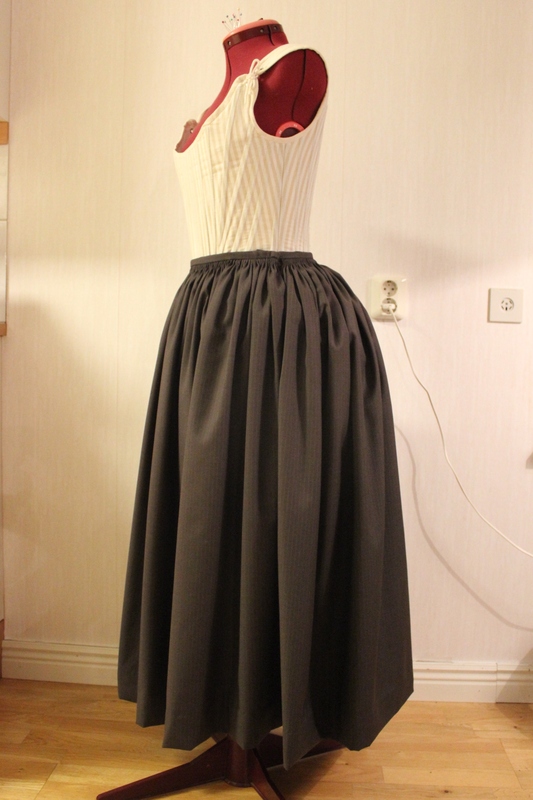 I started with the petticoat (since I just needed something simple to occupie my hands and thoughts from work). 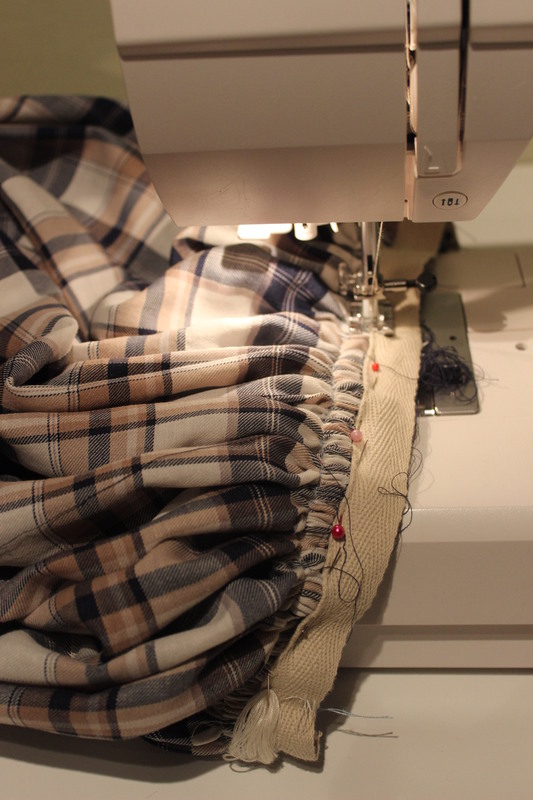 Sitting in the sofa, watching old series, I managed to finish it in a couple of nights. 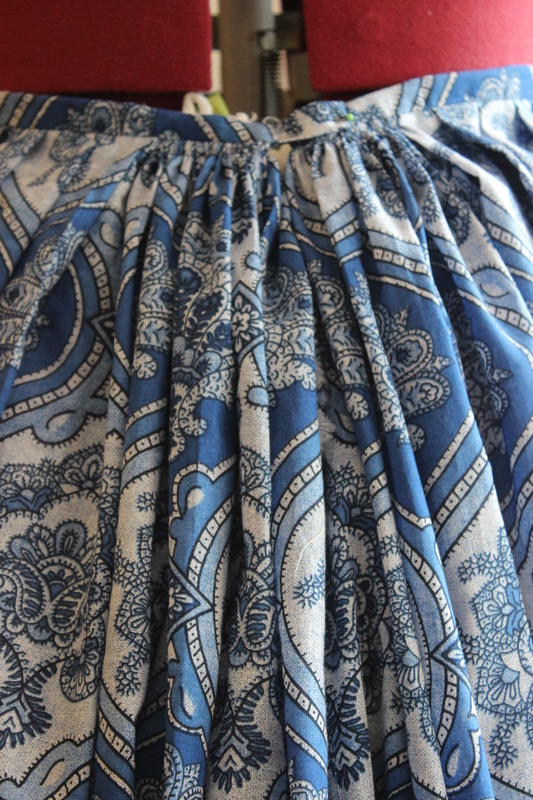 But just as I was about to put it away as finished, I noticed the huge amount of fabric at the center front. 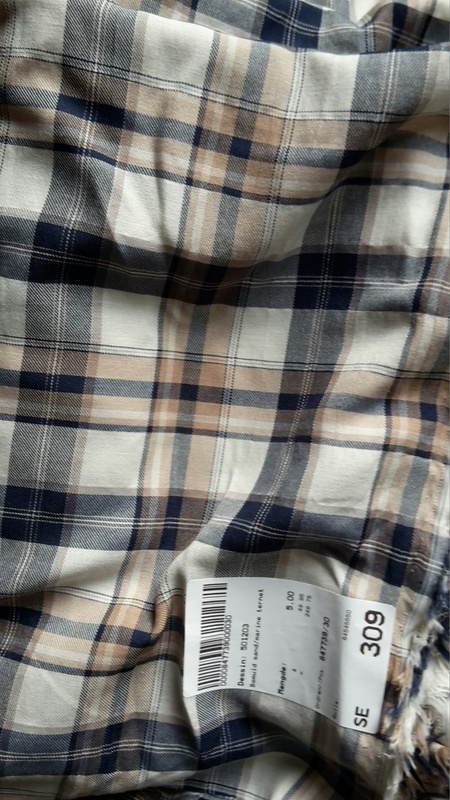 That didn’t look quite right. 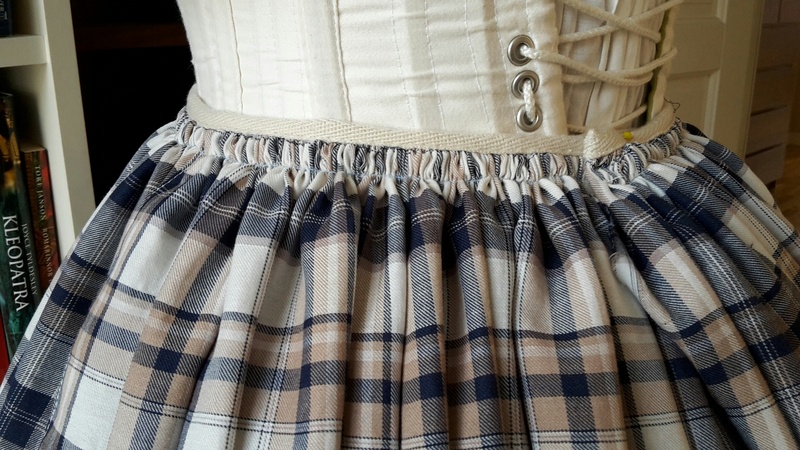 And after some additional image searching I knew I needed to rework the pleating to get a neater appearance under neath the dress. 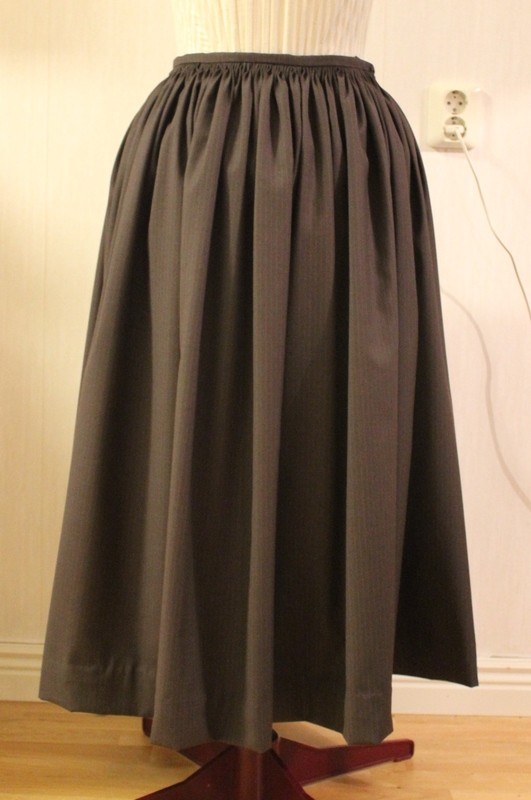 So I ripped the waistband of, re-pleated the skirt and stitched it back on. 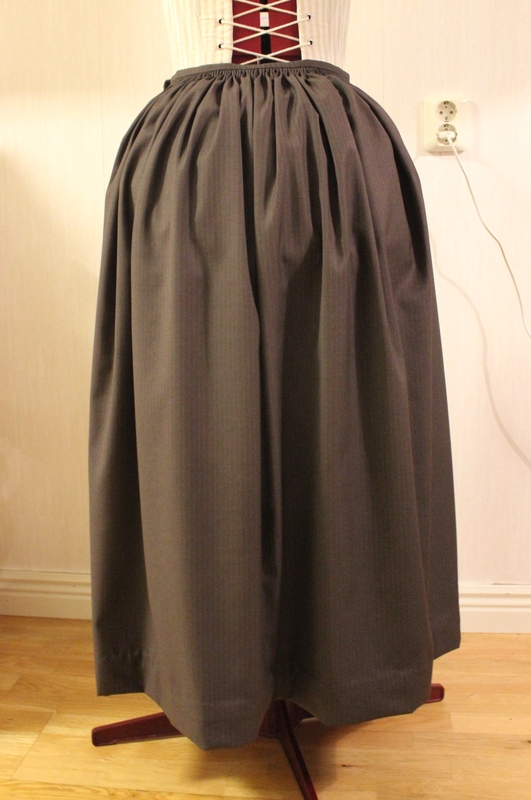 Unfortunately I forgot to take proper, and detailed, finishing photos of the skirt before storing it. 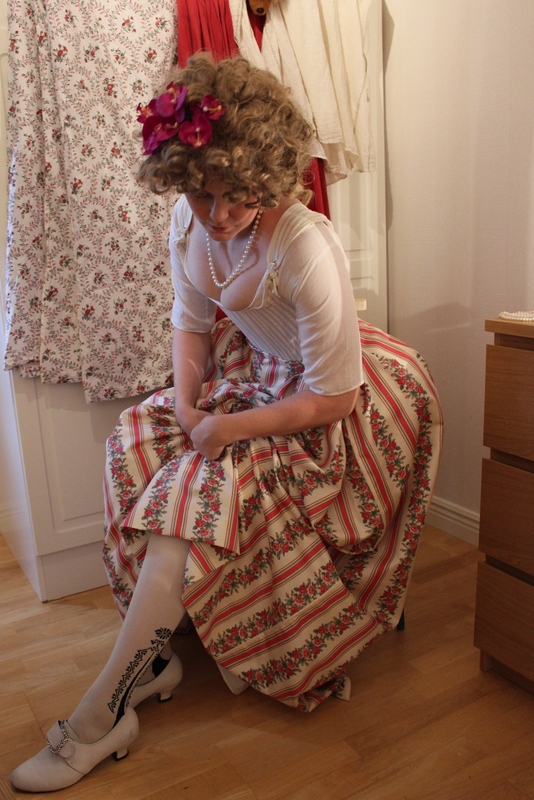 But I did get a quick photoshoot. 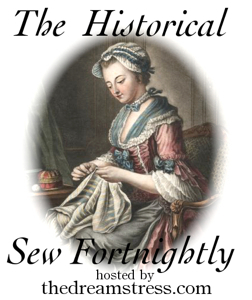 Poem: Parts of Female Fashions for 1799 by Mary Darby Robinson. 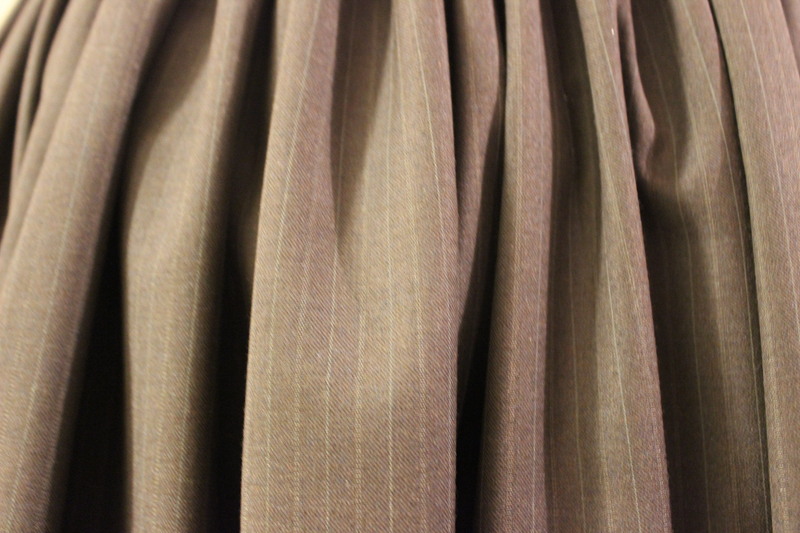 Pattern: None, just cut two lengths of fabric and fiddled with he pleats until it looked okay. 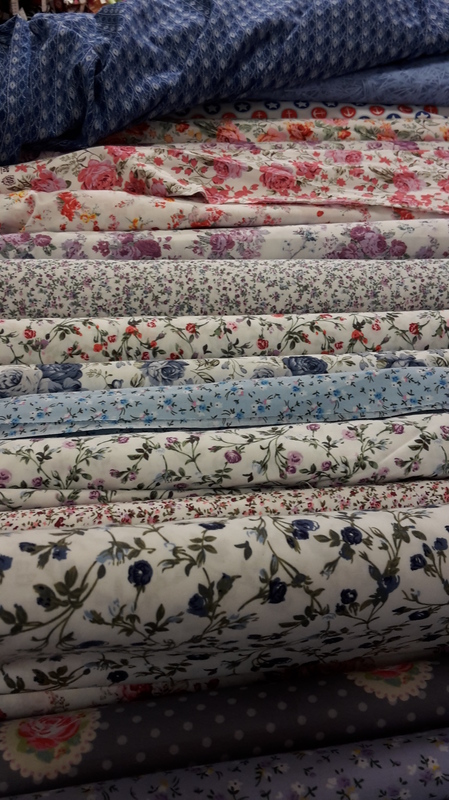 Fabric: 1,3 m of flowery polyester satin (yes I now, but it was Sooo pretty). 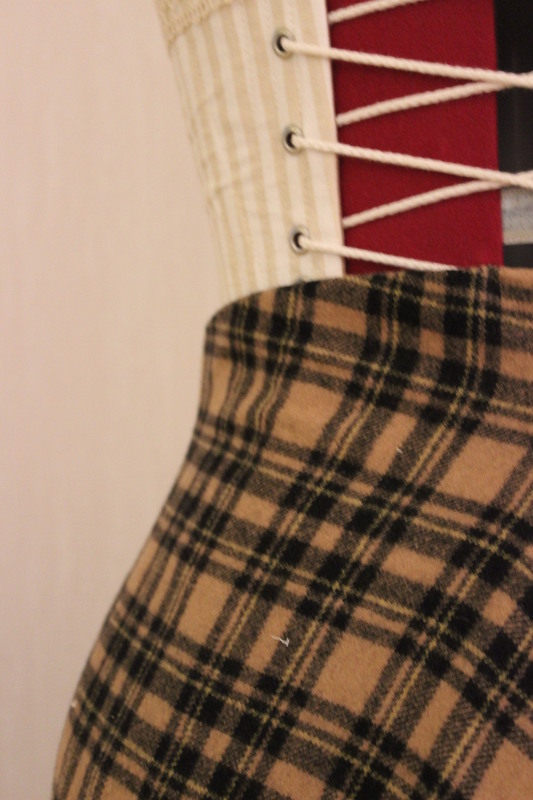 Notions: Thread and 2 m of cotton ribbon for tying at the waist. 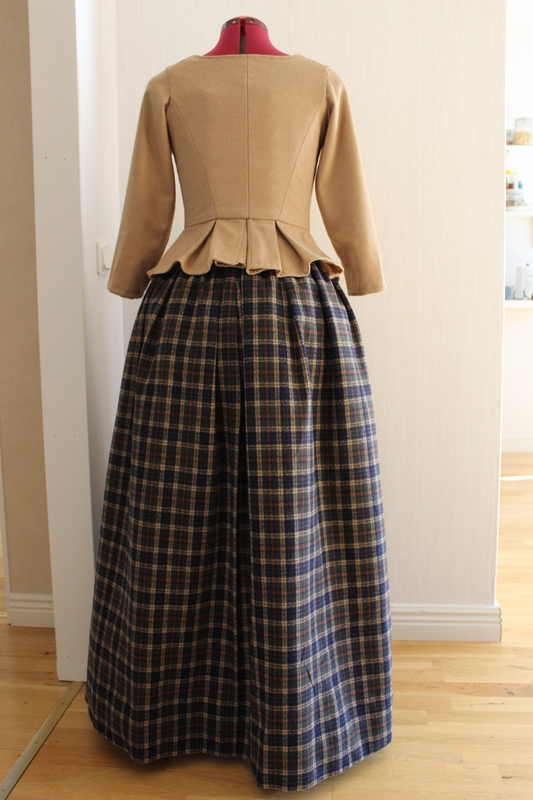 How historical accurate: So so, the material are totally wrong, but it is all hand stitched and I think the look of it are pretty okay. 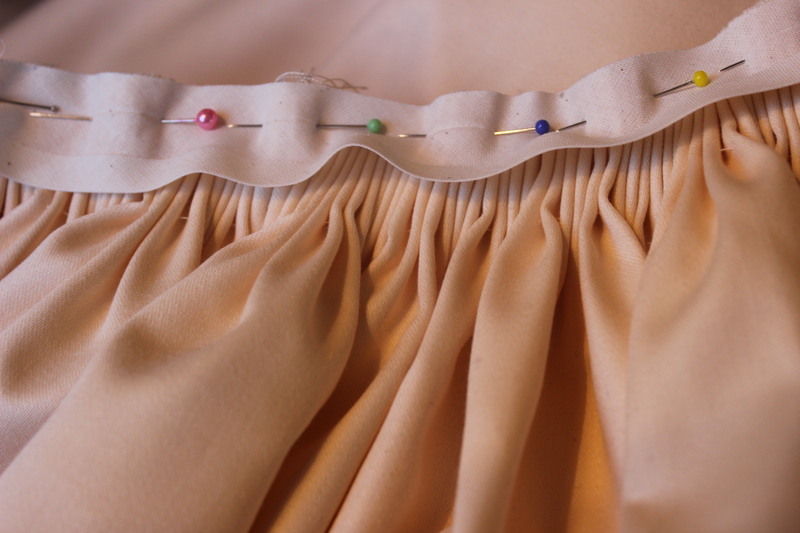 Time: About 8 hours, including the readjusting of the pleats. 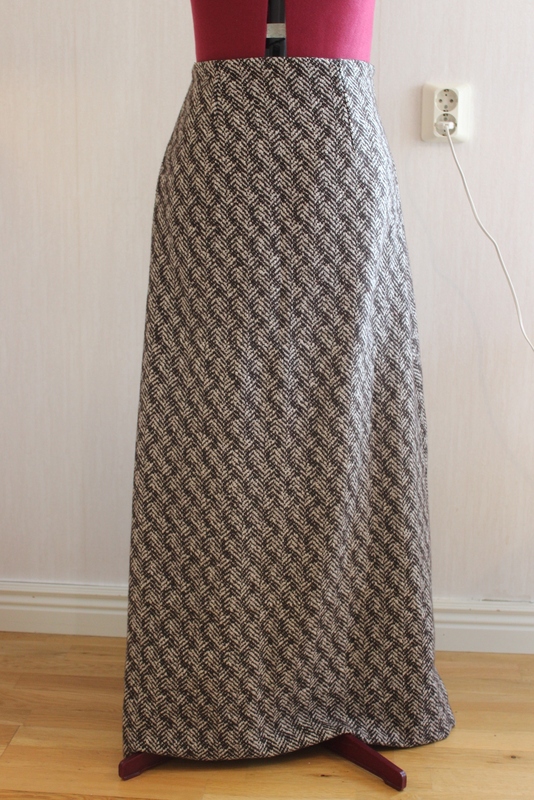 Cost: 100 Sek (16 Usd). 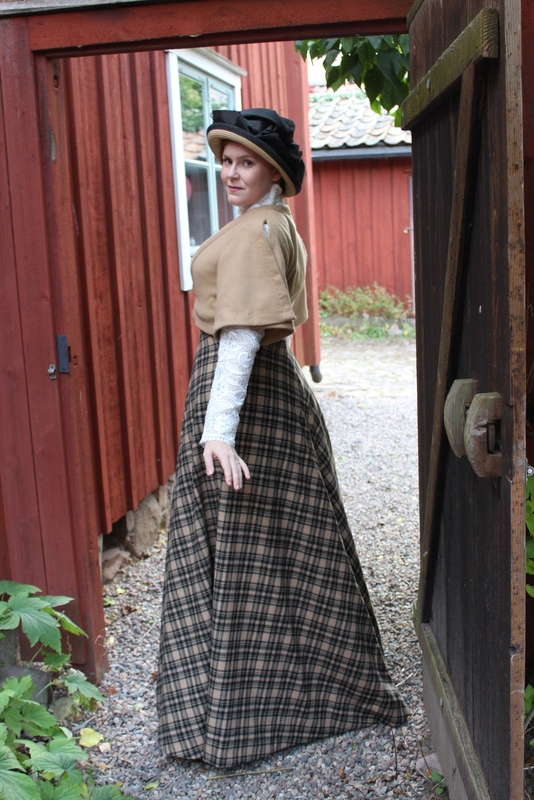 First worn: around the house for photos.